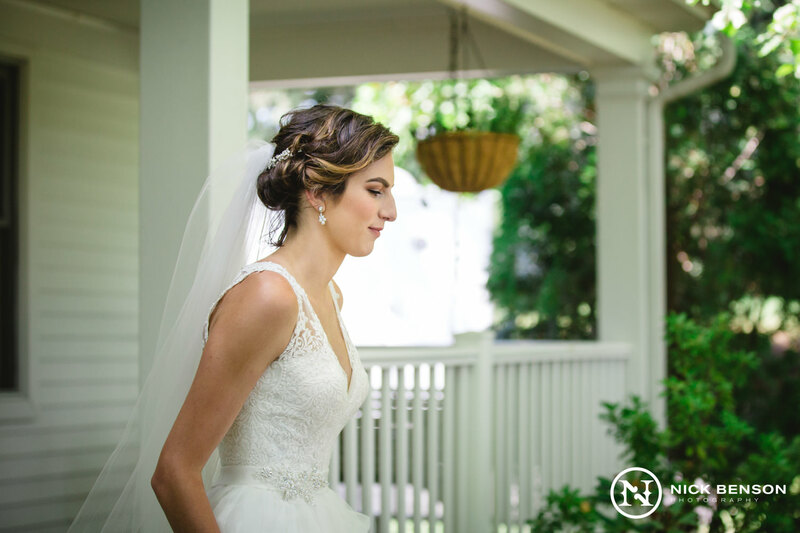 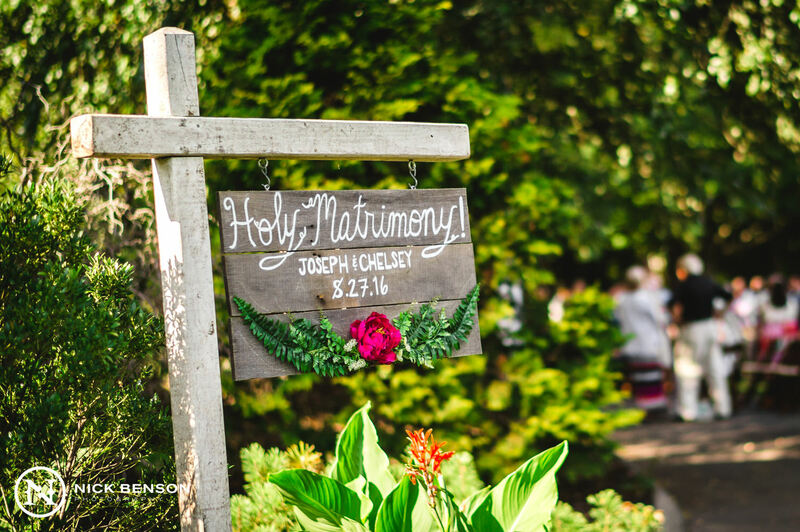 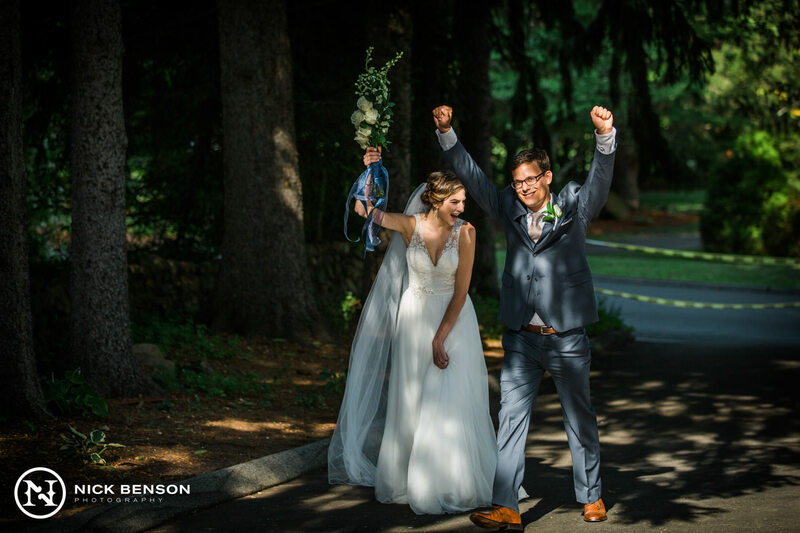 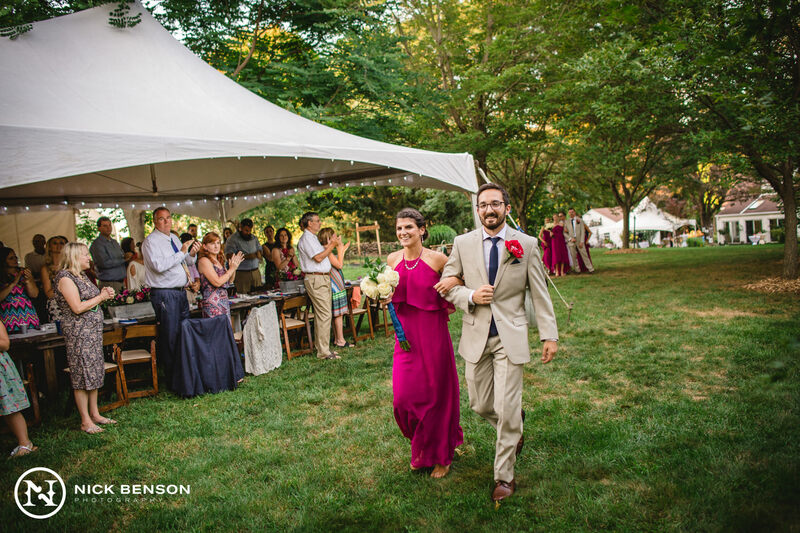 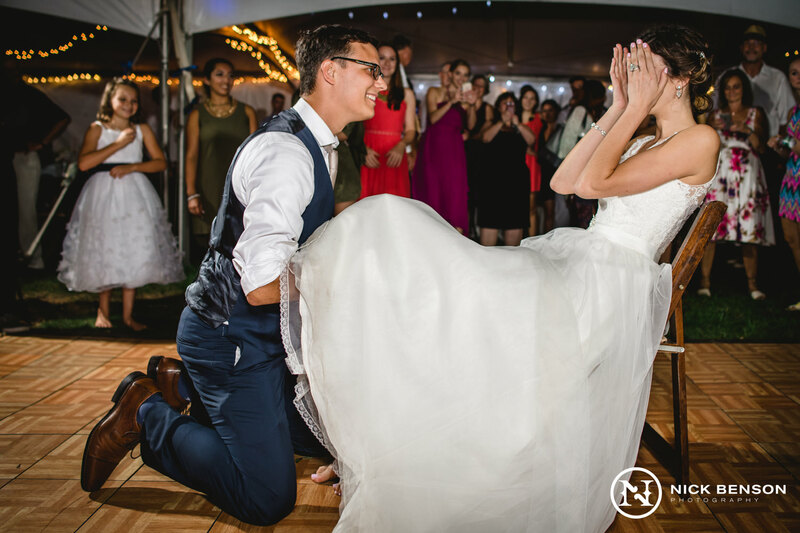 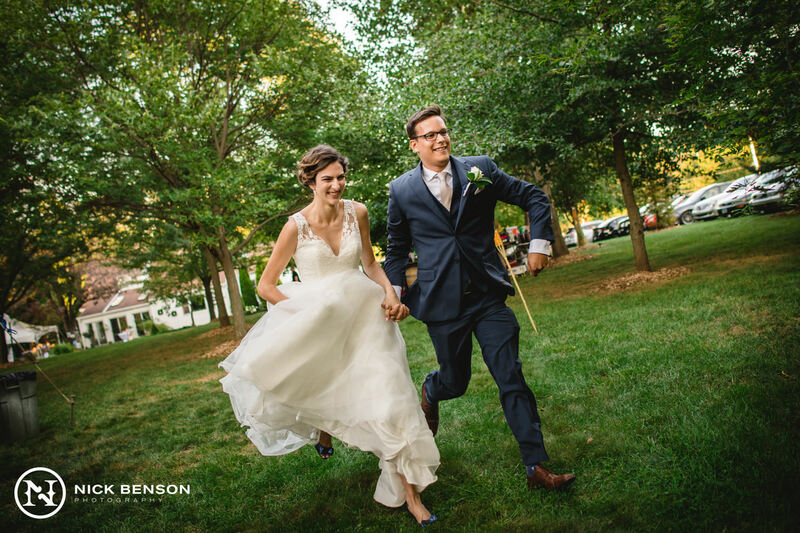 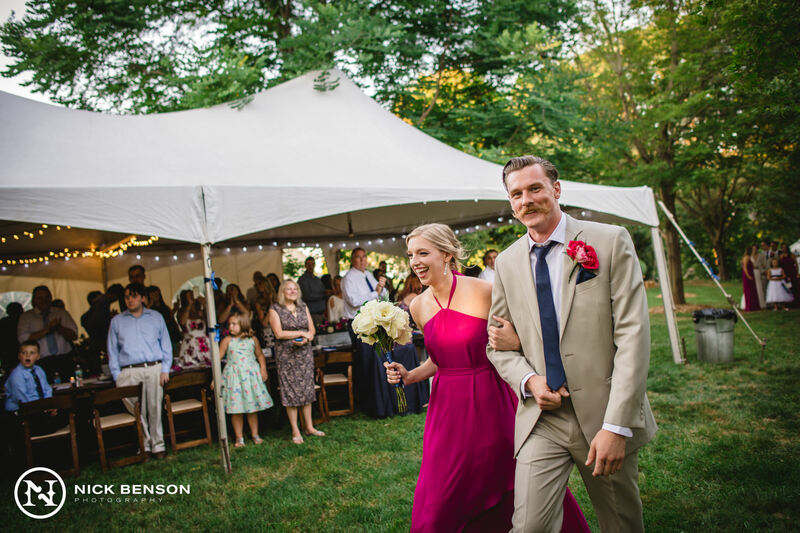 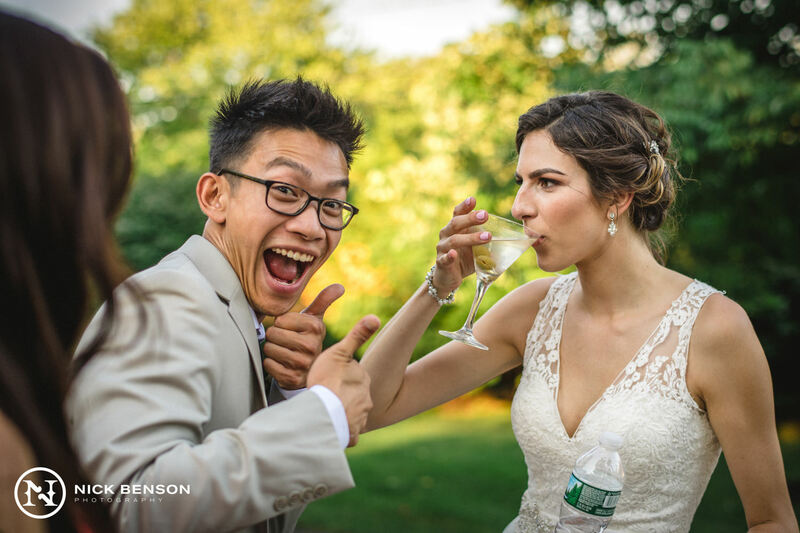 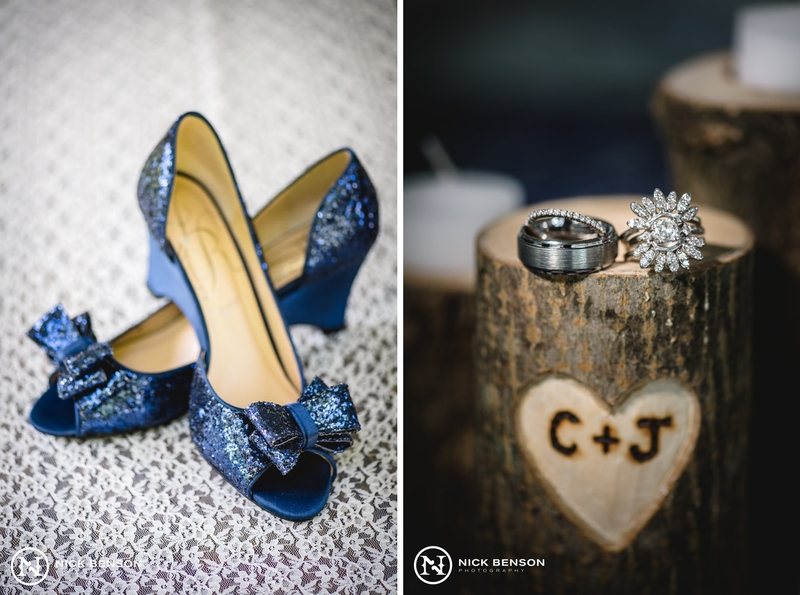 This was not your average “backyard wedding.” Chelsey and Joe were married in the front yard of their home in Northford, CT, and held their reception just steps away in their own back yard. 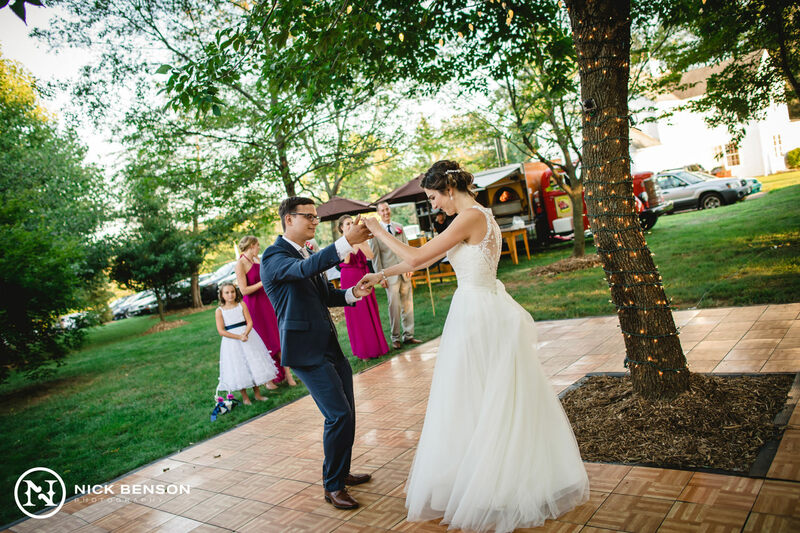 They transformed their property into an actual wedding venue that reflected their love and individual personalities. 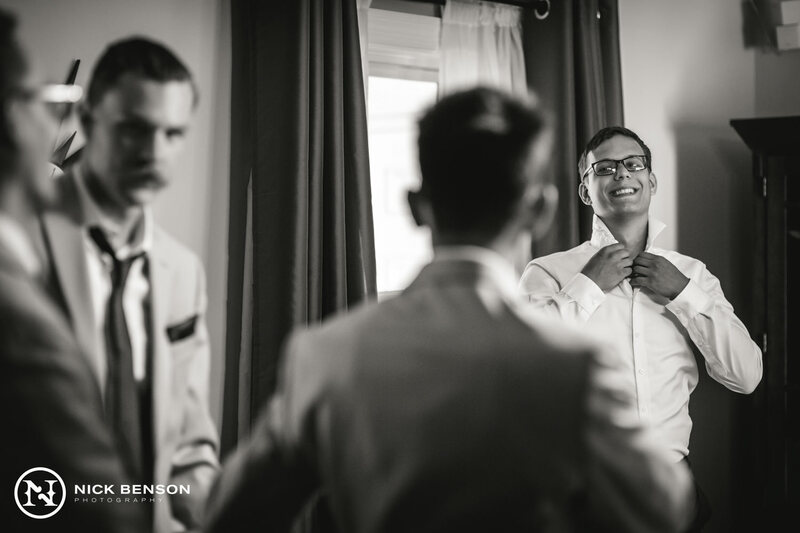 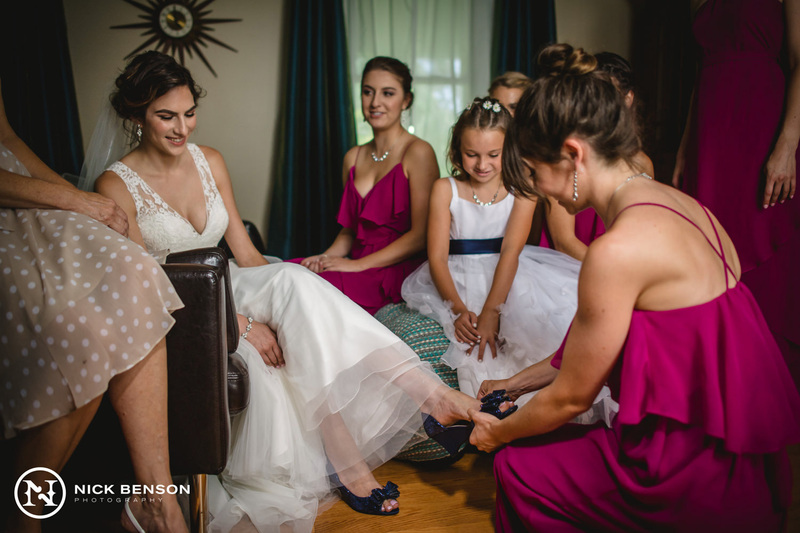 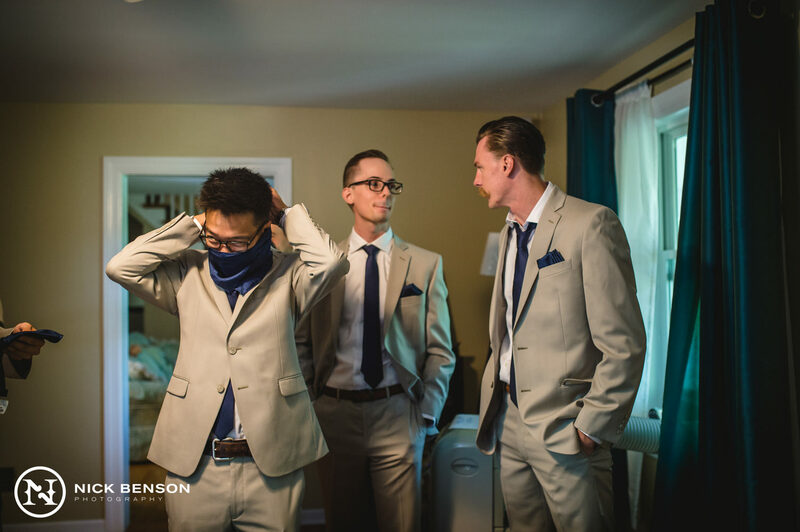 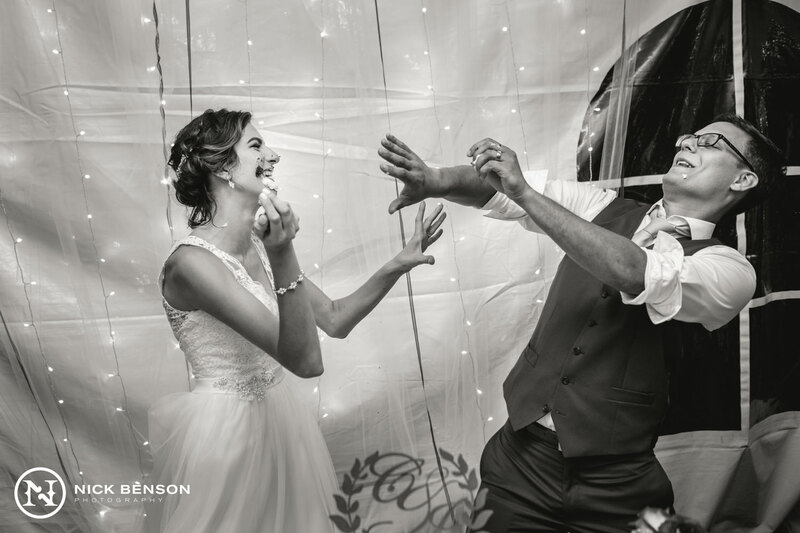 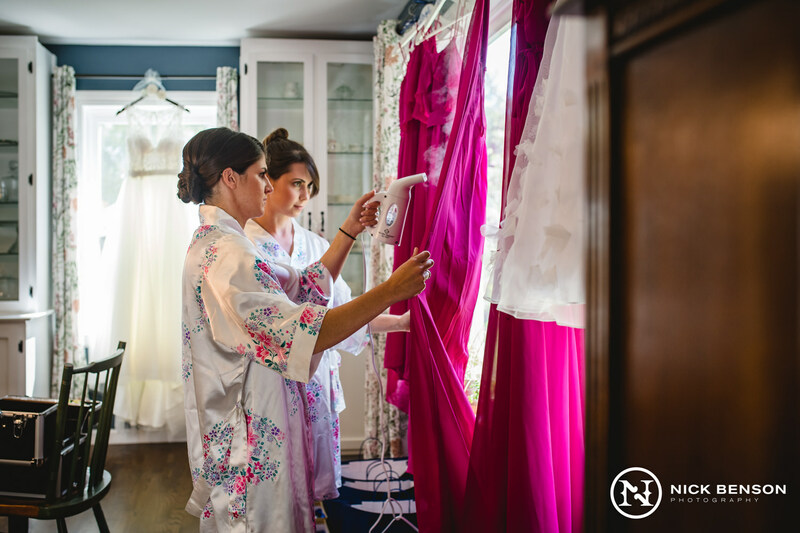 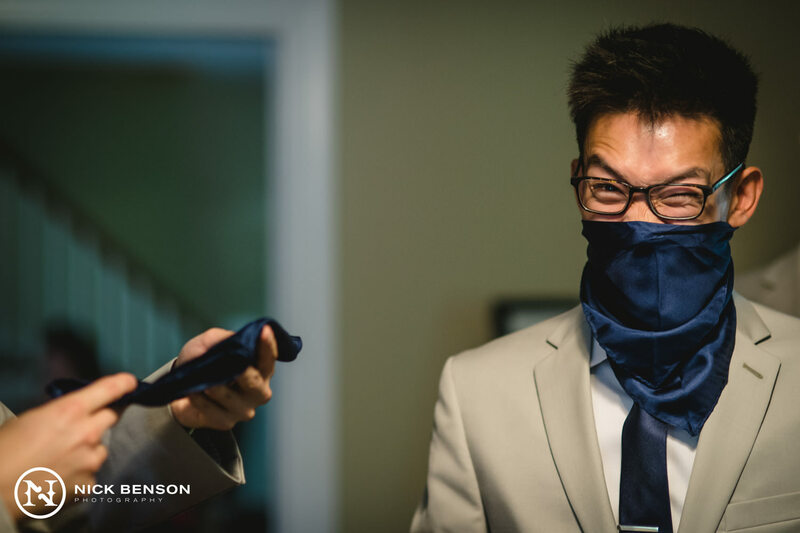 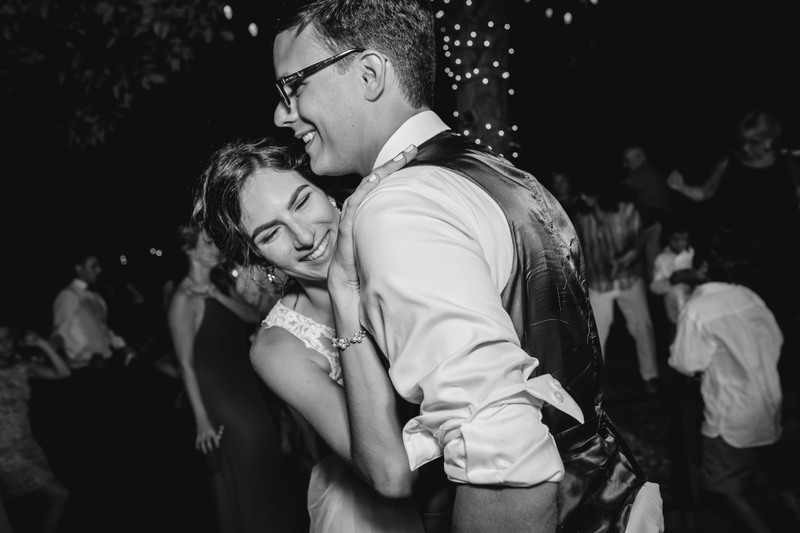 By putting a personal spin on their wedding, they were able to make the experience unique in subtle, yet meaningful ways. 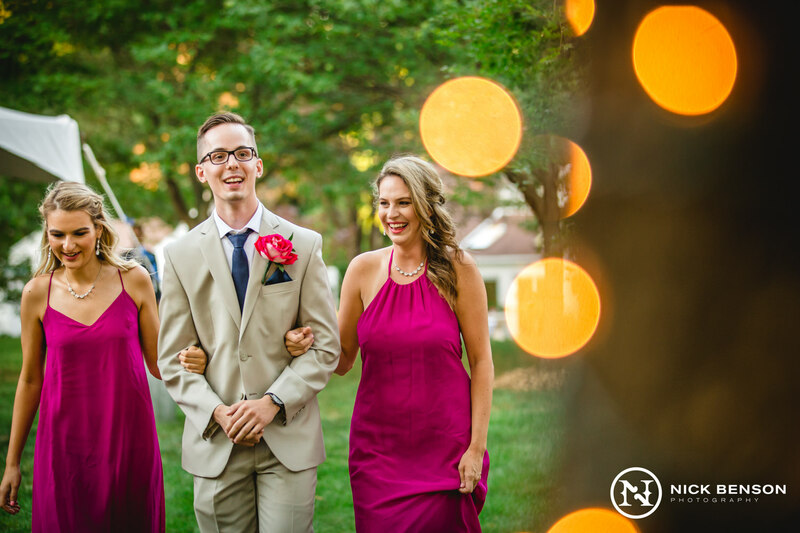 Chelsey & Joe met and dated throughout high school, and have been together through thick and thin. 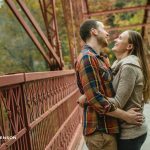 They recently took the next step and purchased their first house shortly before getting engaged. 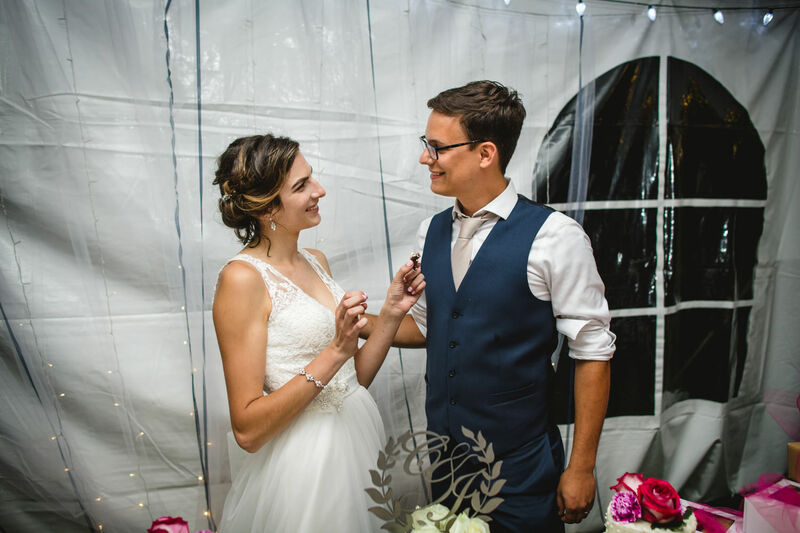 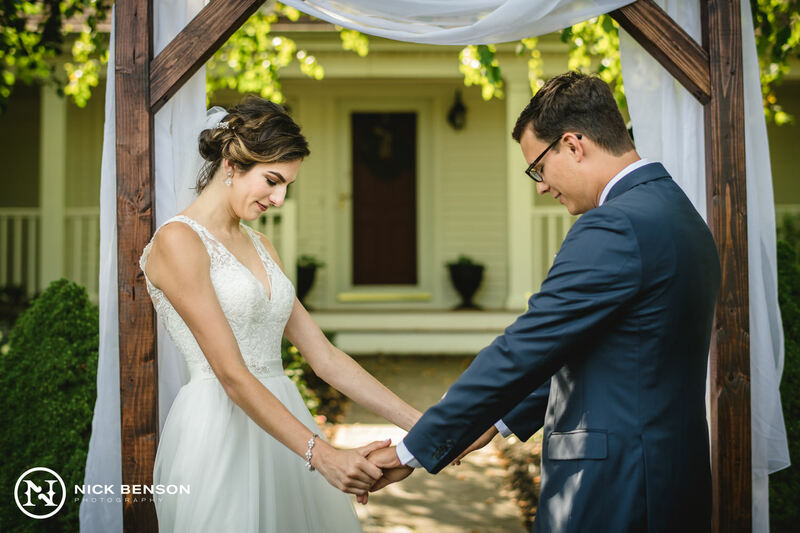 After putting an endless amount of time and hard work into fixing it up, they wanted to showcase the progress they had made by hosting their wedding at their new home. 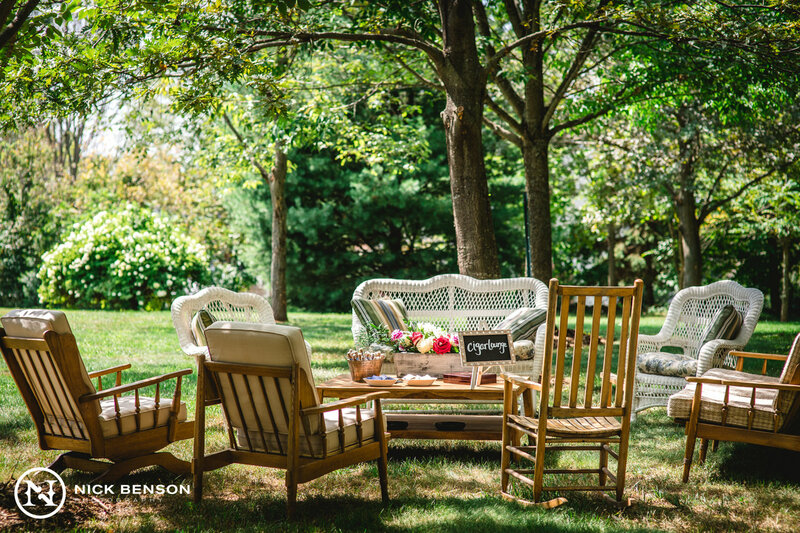 Once we saw their backyard we completely understood why they wanted to take advantage of this one-of-a-kind property they had worked so hard to make their own. 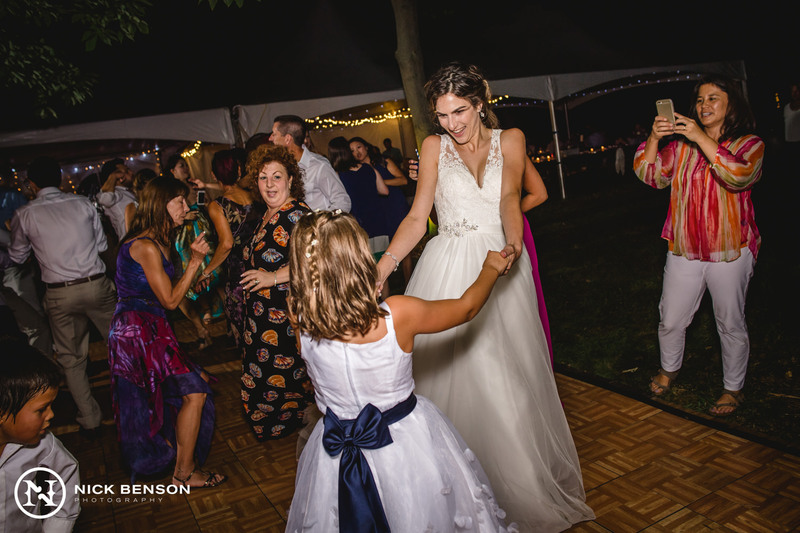 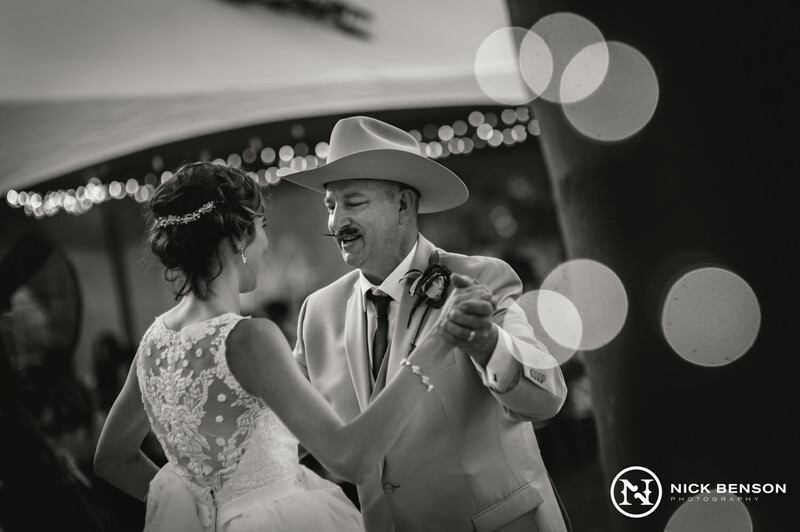 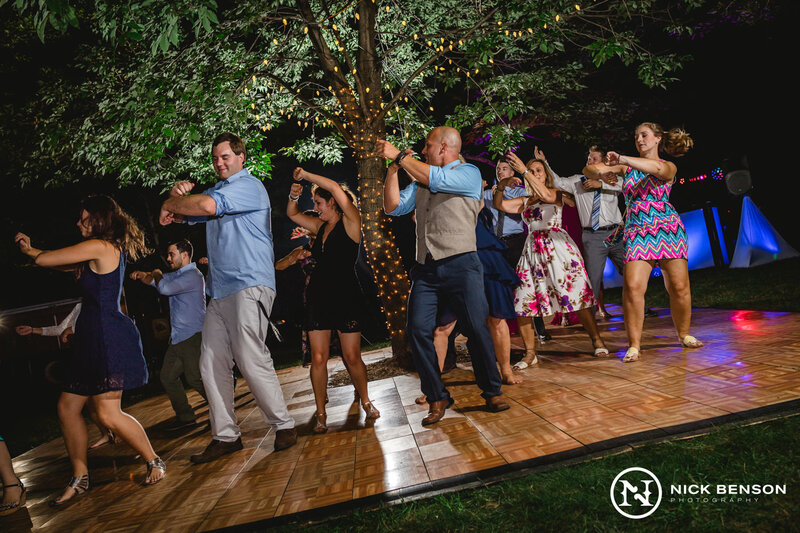 We were flattered that they valued our opinion and included us in a lot of the planning, and trusted our advice – especially toward the layout of the dance floor. 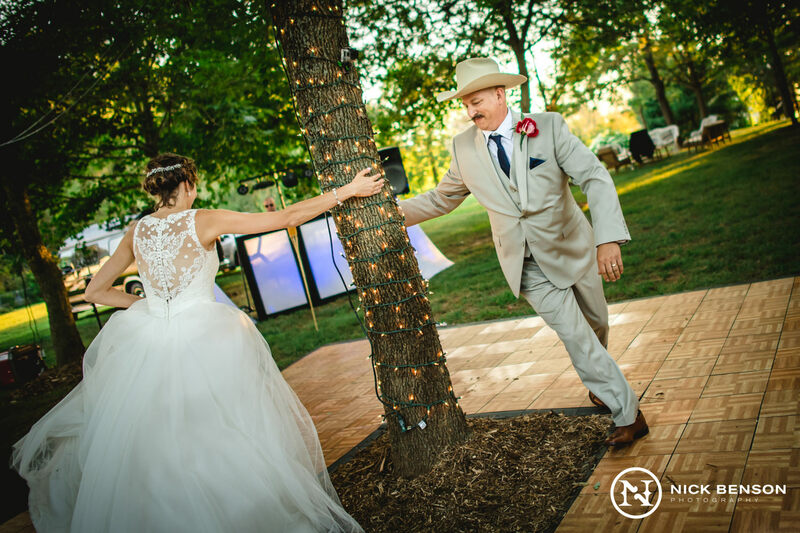 Large beautiful trees scatter their landscape and with the right positioning, they created a very natural flow to the layout; inviting guests to enjoy cocktails on the lower half of the property, while directing them up to the top half of the yard for dinner and dancing. 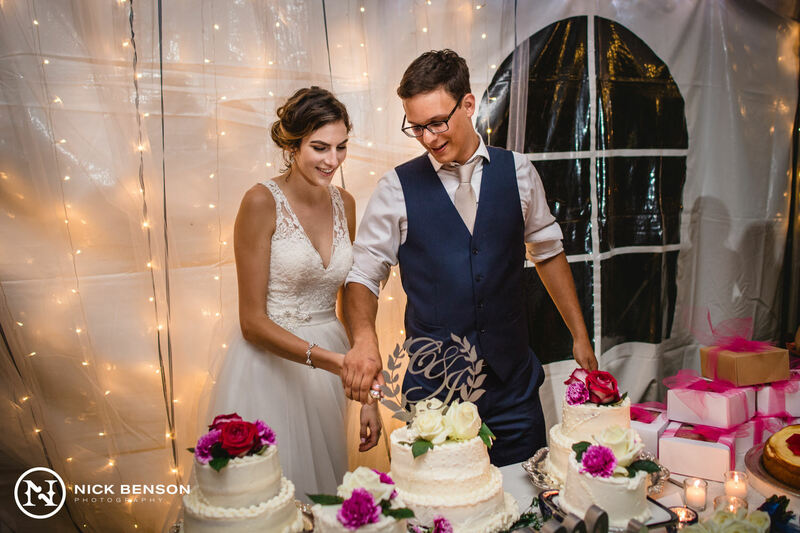 The layout was more functional than several wedding venues we’ve seen in the past, and it didn’t cost them a penny to rent. 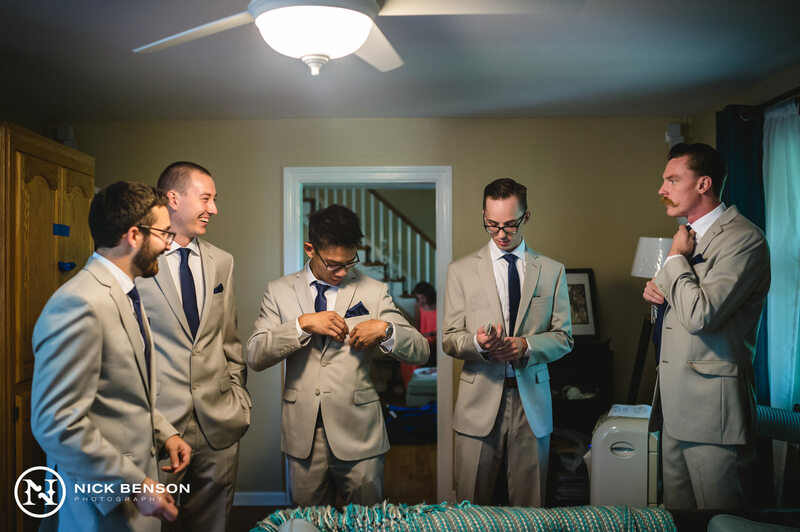 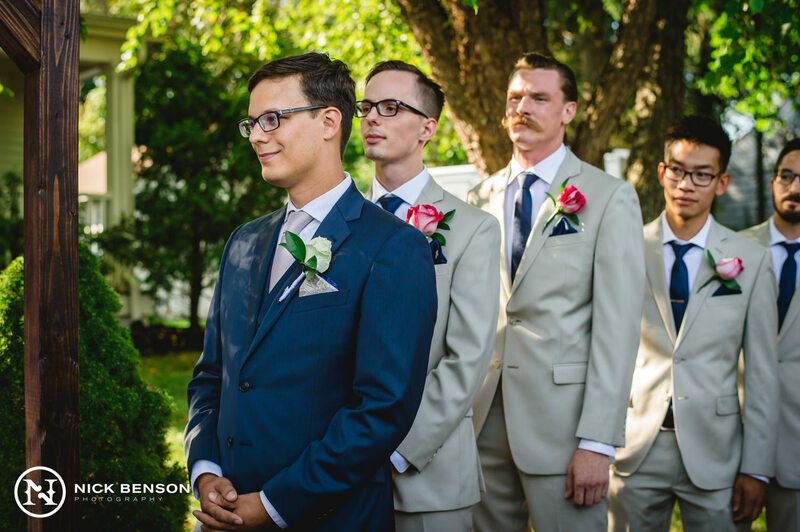 The four of us joked that they had nothing to be nervous about since this was technically their second time getting married! 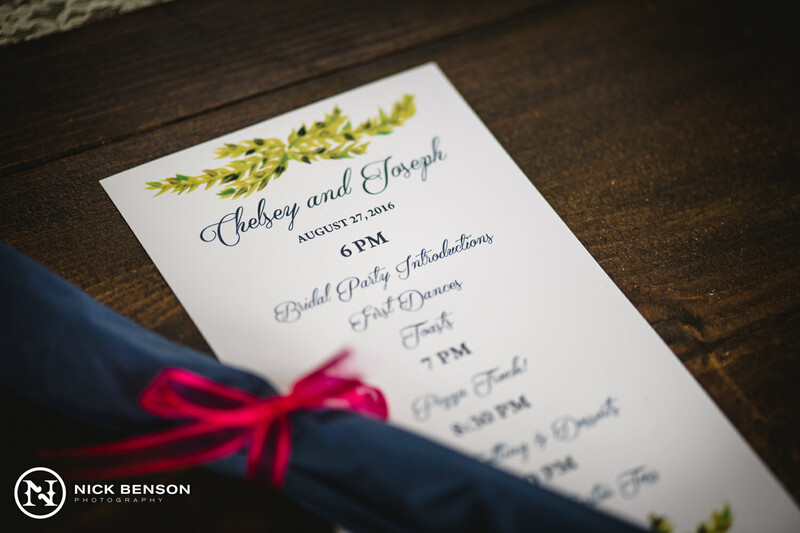 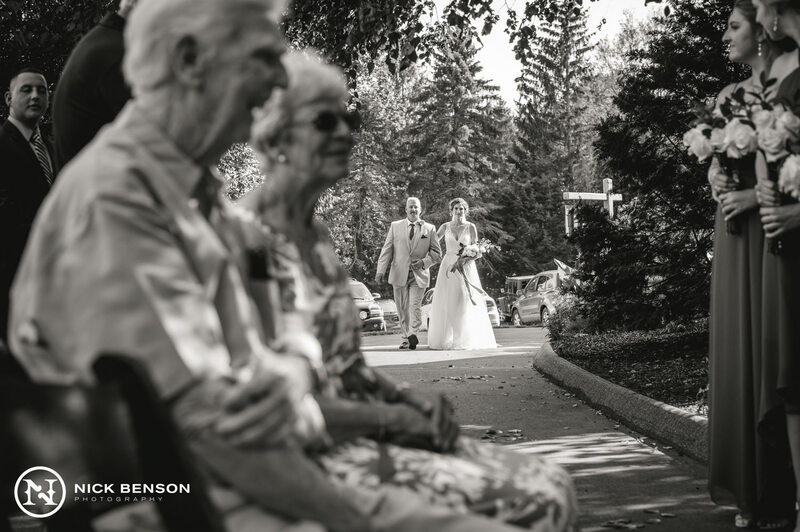 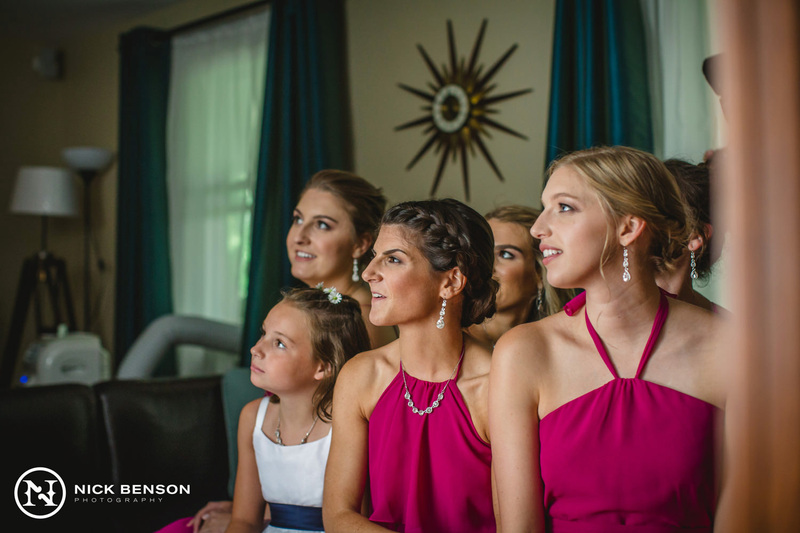 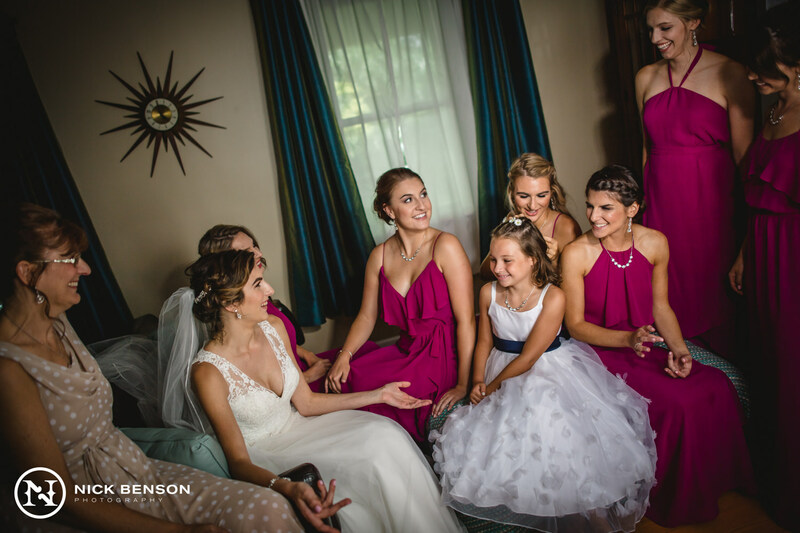 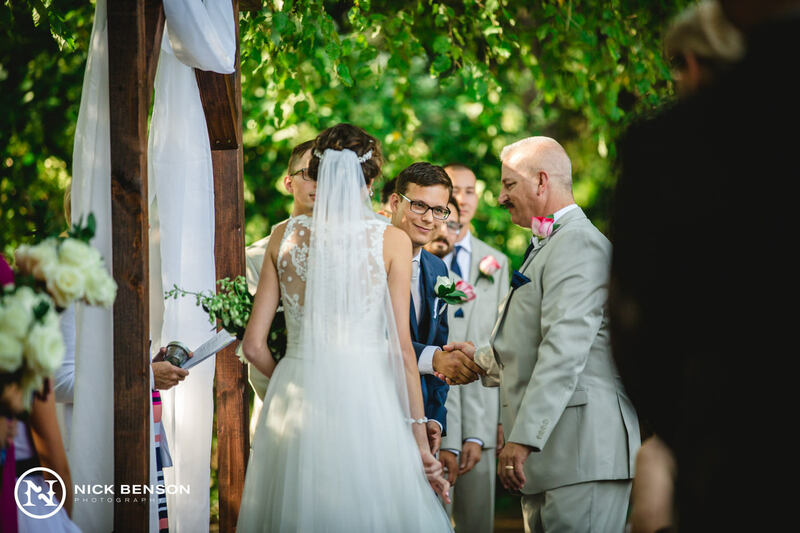 Keeping with Catholic tradition, Chelsey & Joe had been officially married the day before in their church with just their immediate family to accompany them. 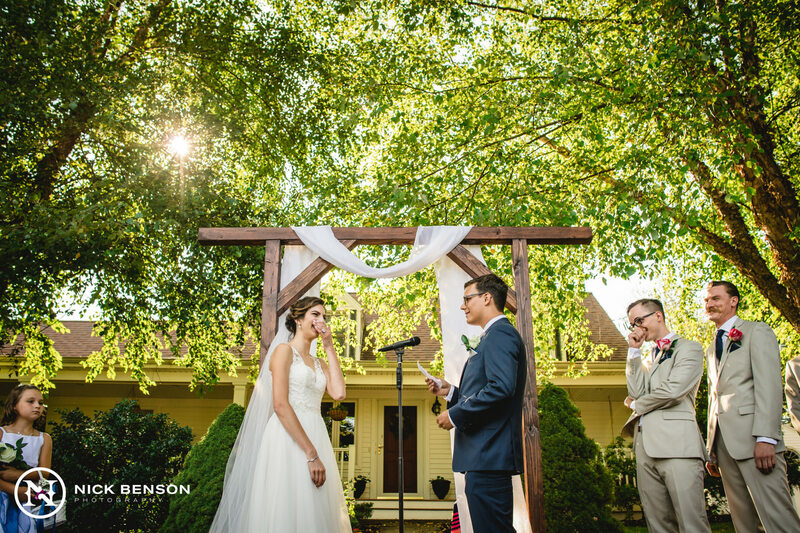 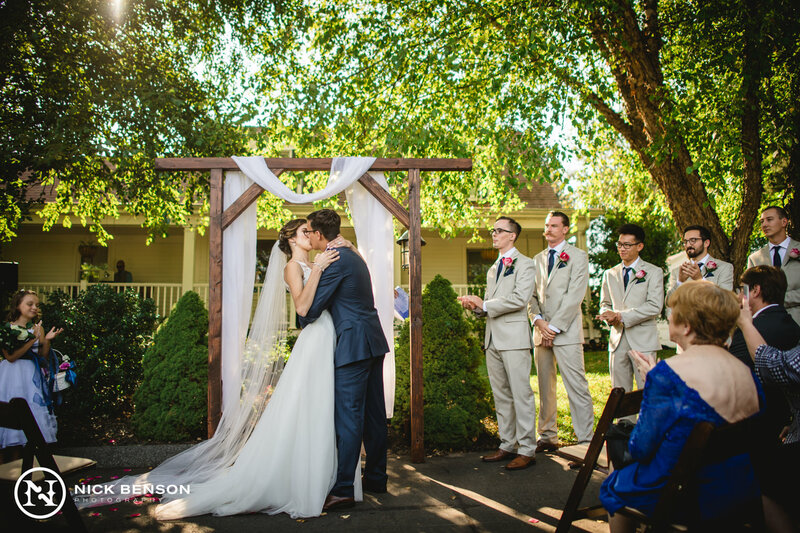 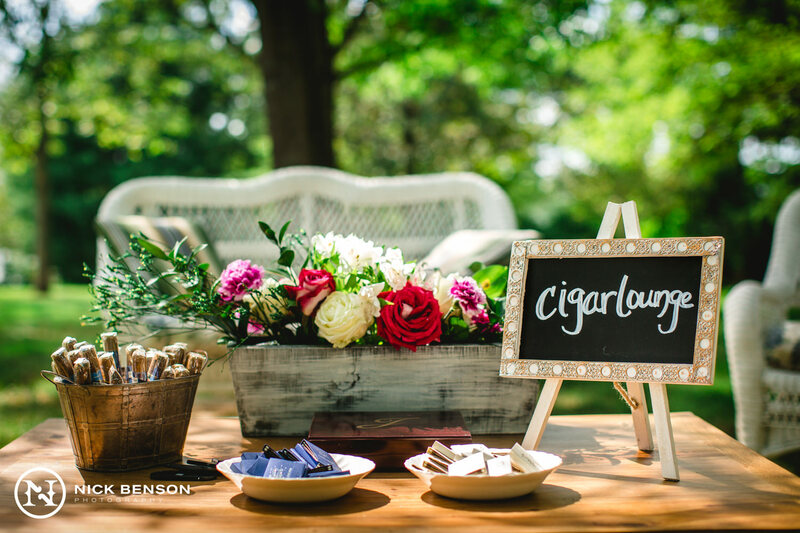 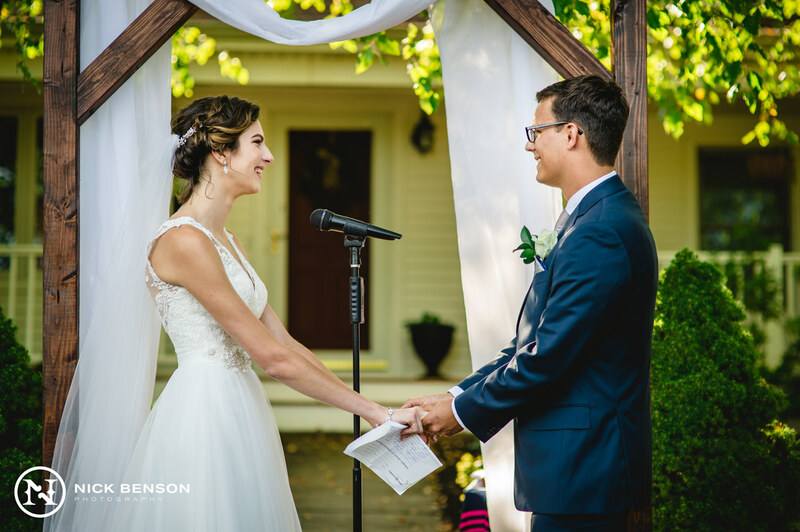 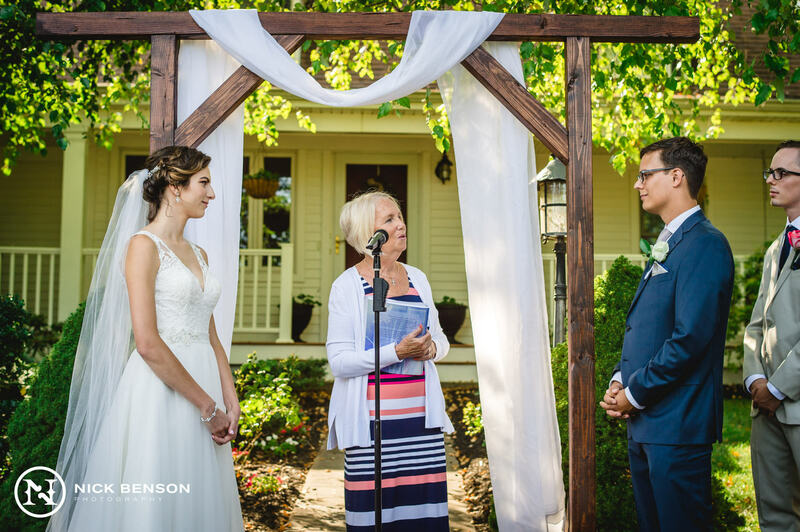 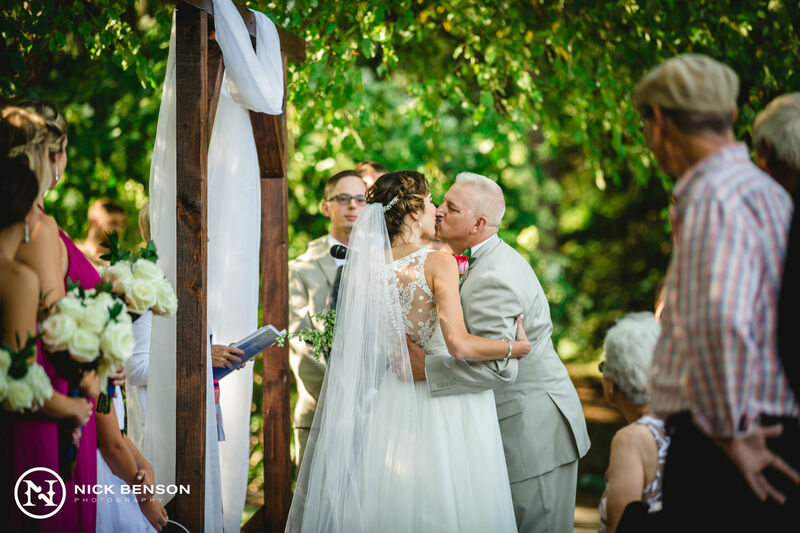 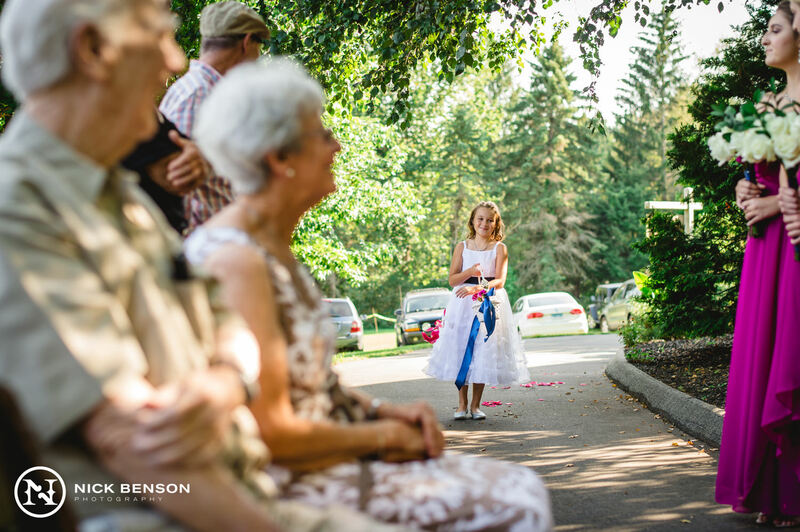 This allowed them to have an outdoor ceremony in their front yard the next day that was simple and sweet. 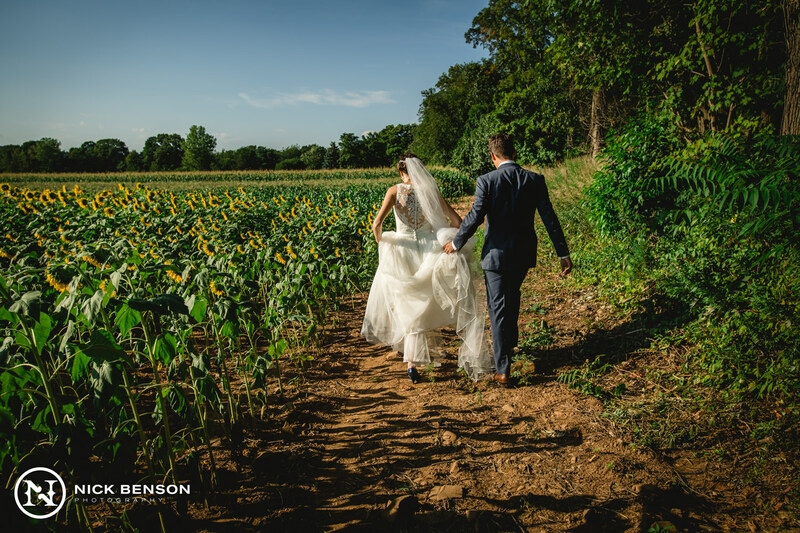 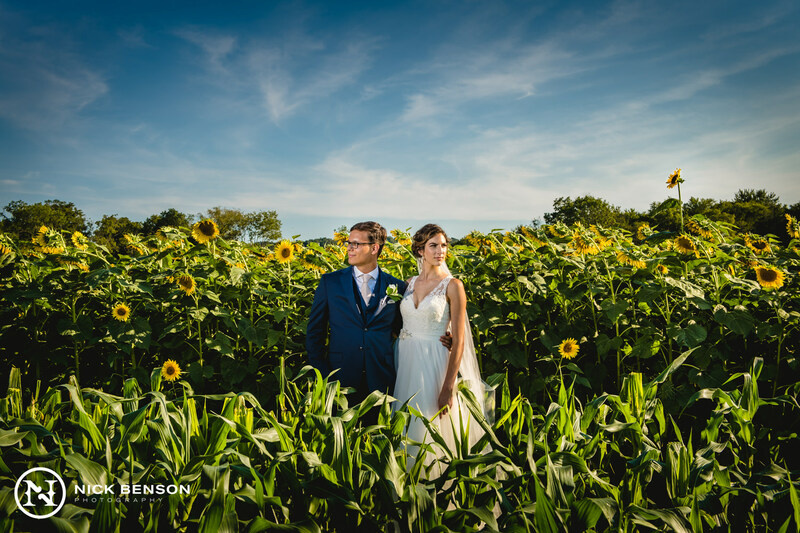 After the ceremony, they had the idea to go to a sunflower field located on the nearby Larry Augur Farm, in North Branford, CT. 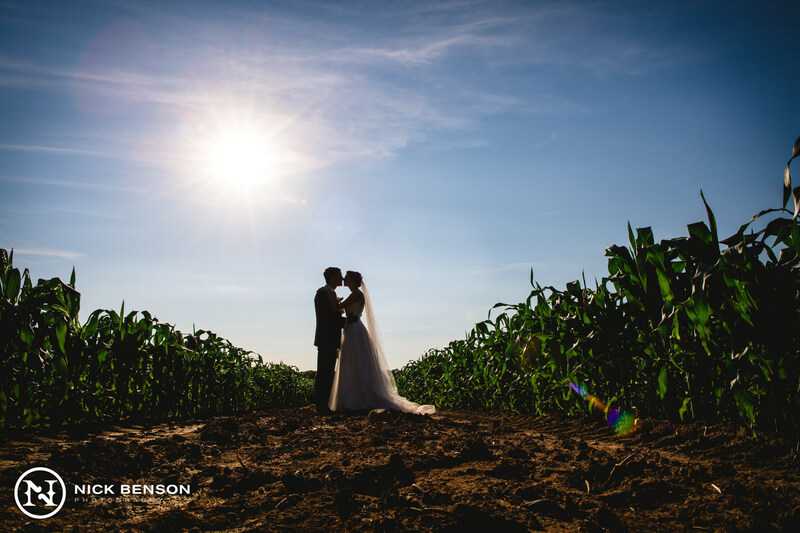 Without a cloud in the sky, we faced some extremely overpowering sunlight that created a tough situation to photograph. 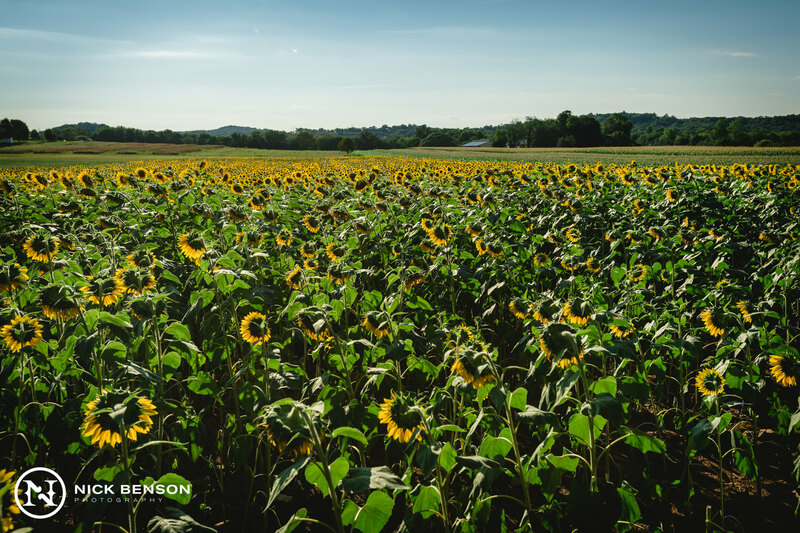 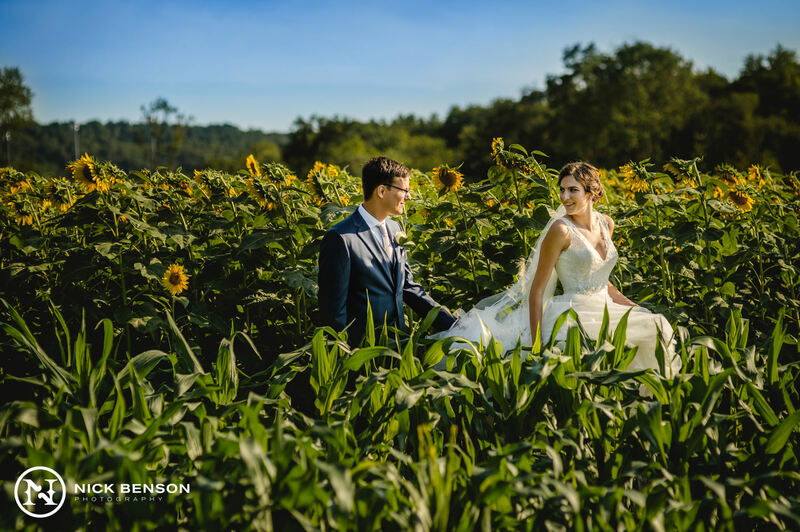 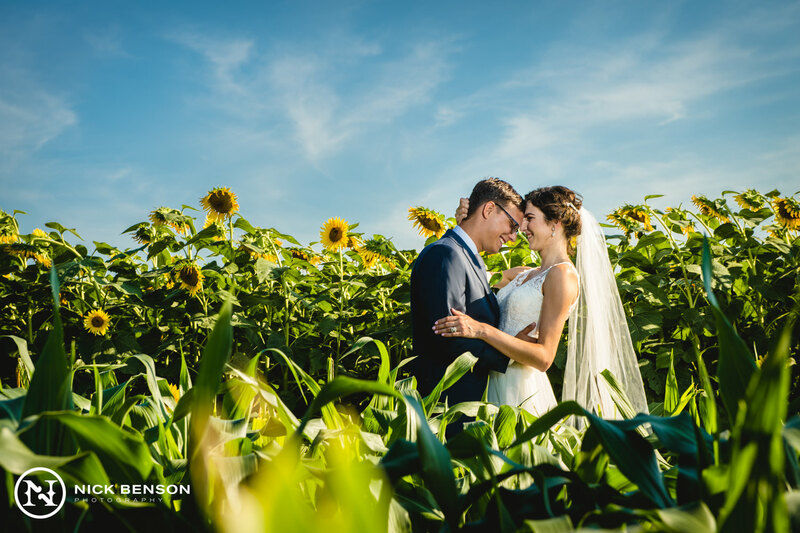 Chelsey, alongside Joe, embraced the sun and with some team effort, we managed to overcome the bright sun for some strong shots from the sunflower field. 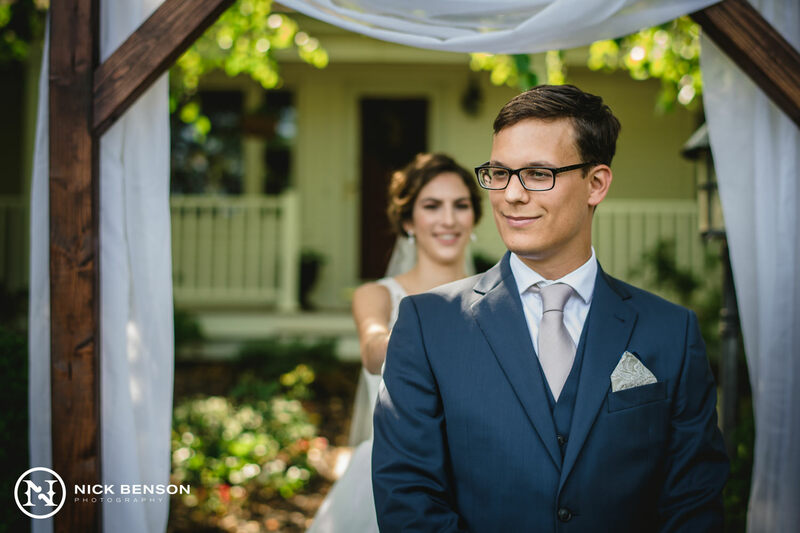 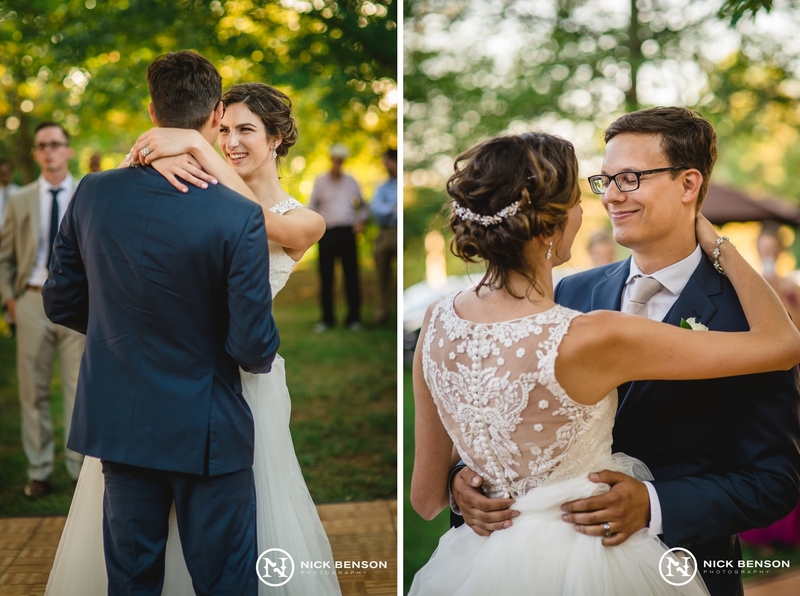 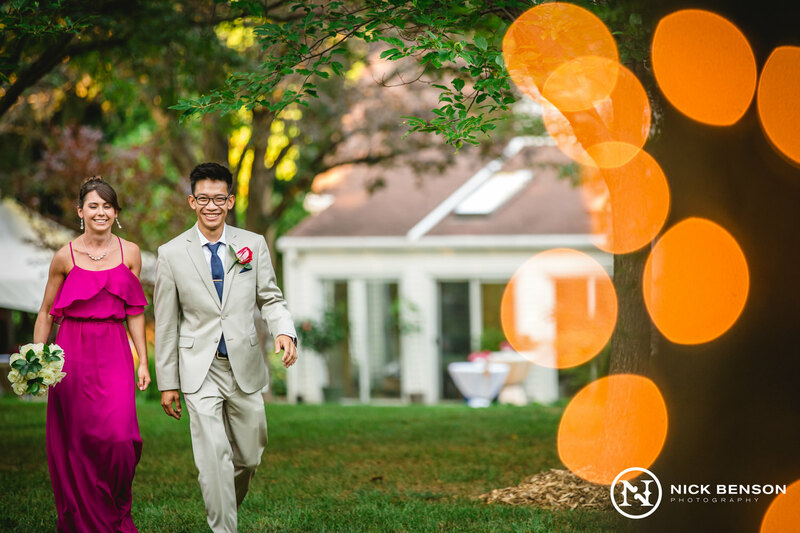 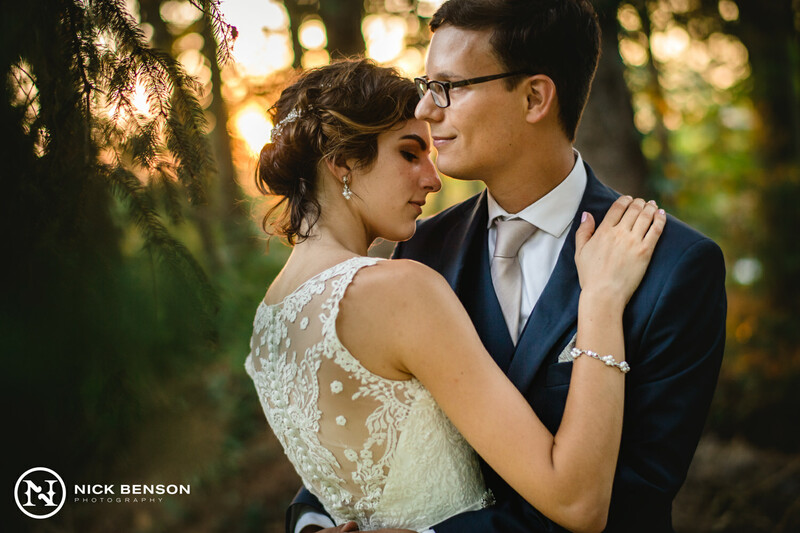 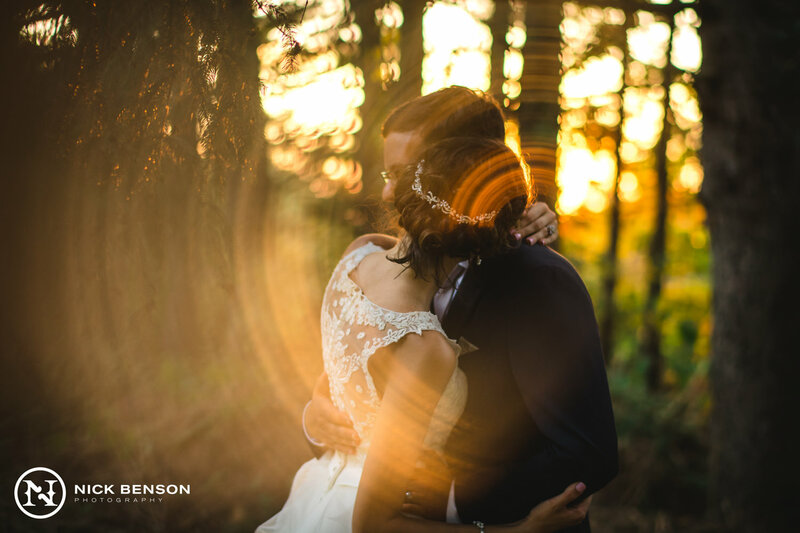 As we arrived back to the house for the reception, we noticed the sun was illuminating the wooded area at the end of their backyard with a beautiful glow and beaming through the treetops with a very mystical quality. 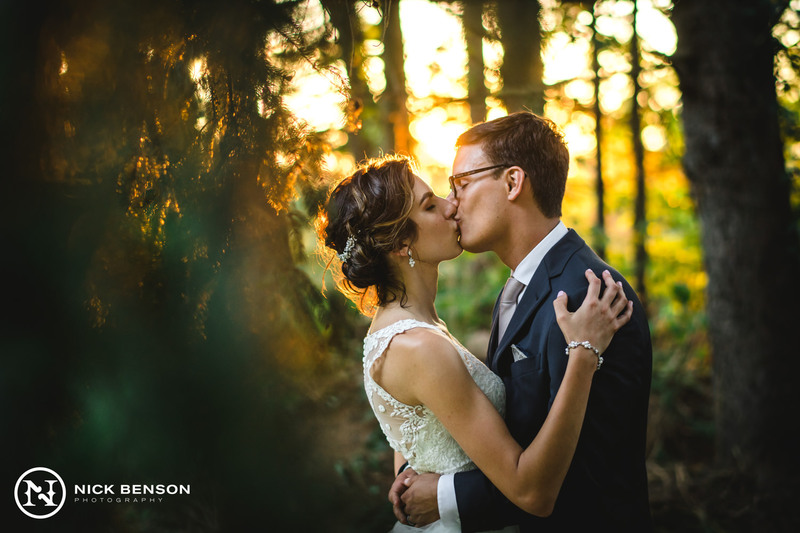 We ran over to take advantage of the dramatic lighting for a few more portraits along the perimeter of their yard within the trees, which ended up looking like we were lost, deep within a forest; proving that with the right angle and a little framing creativity, you can make the most of your surroundings. 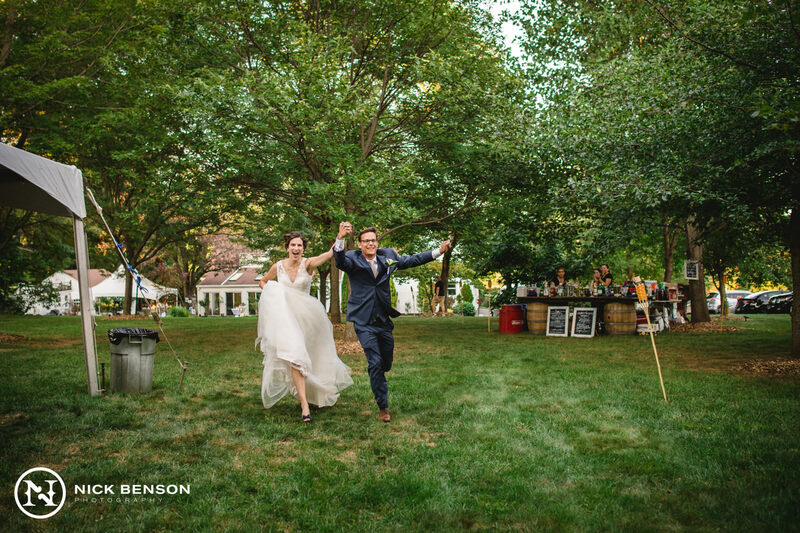 Who would’ve thought, we never had to leave their backyard at all! 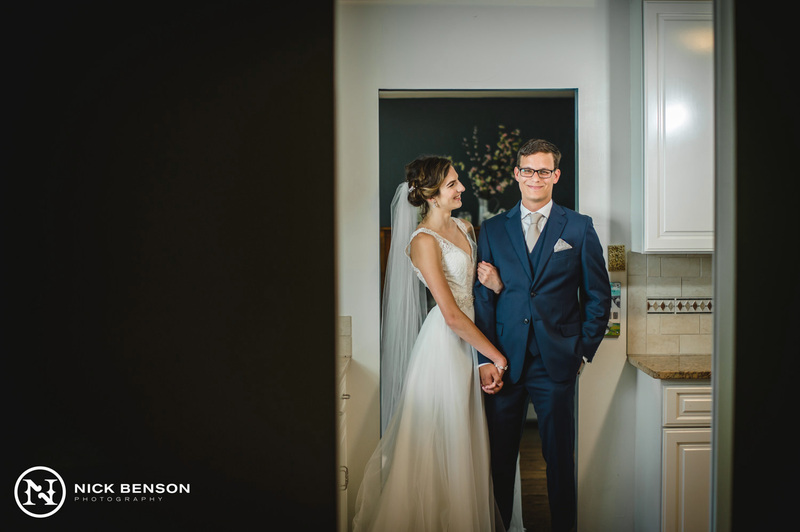 Taking a moment to breathe before the reception started, the couple realized just how busy they had been throughout the day and took advantage of the fact that they were hidden away from everyone to cherish some time to themselves. 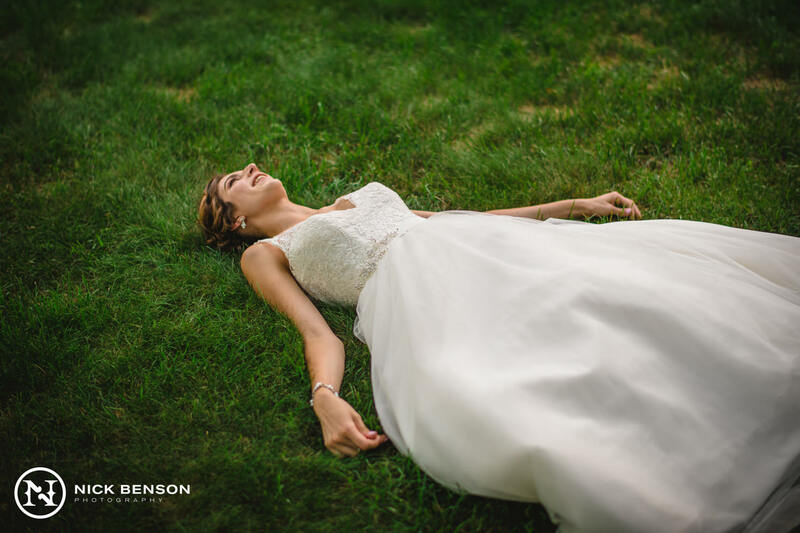 We captured a genuine moment of Chelsey laying in the grass in the backyard just taking a second to soak in this important day that was slipping by too quickly. 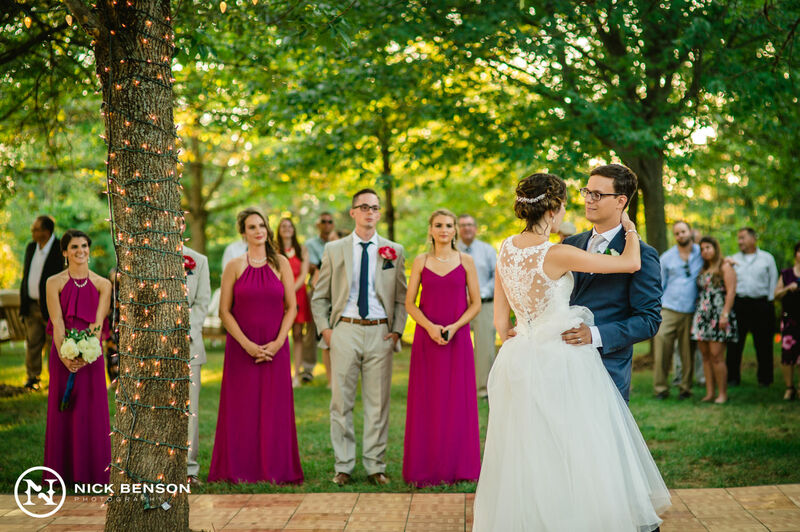 Joe joined her on the grass and they had this serene ‘pause’ where they held hands in appreciation of everyone who had come together to make the day what it was. 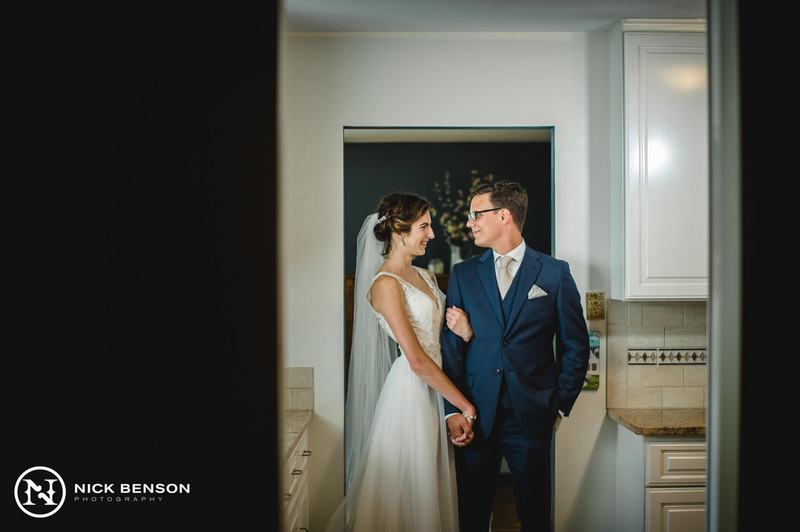 We silently captured their private moment of thanksgiving below. 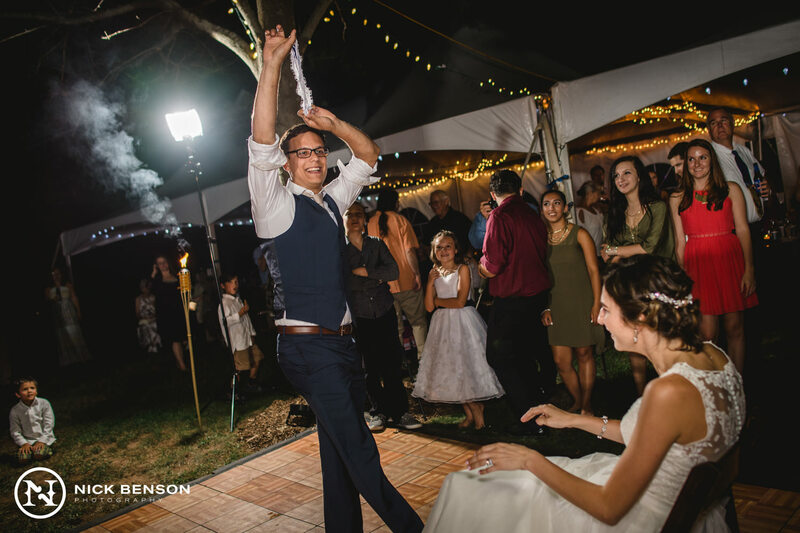 The reception was something you’d only see in a magazine or a movie. 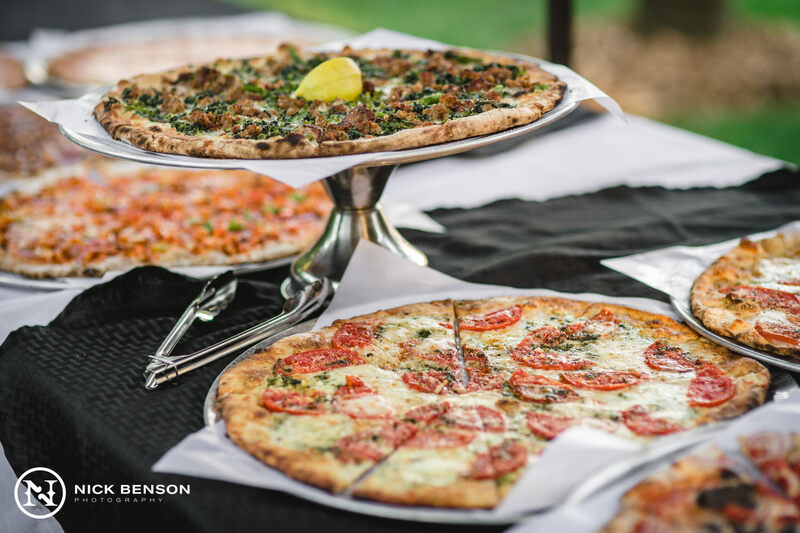 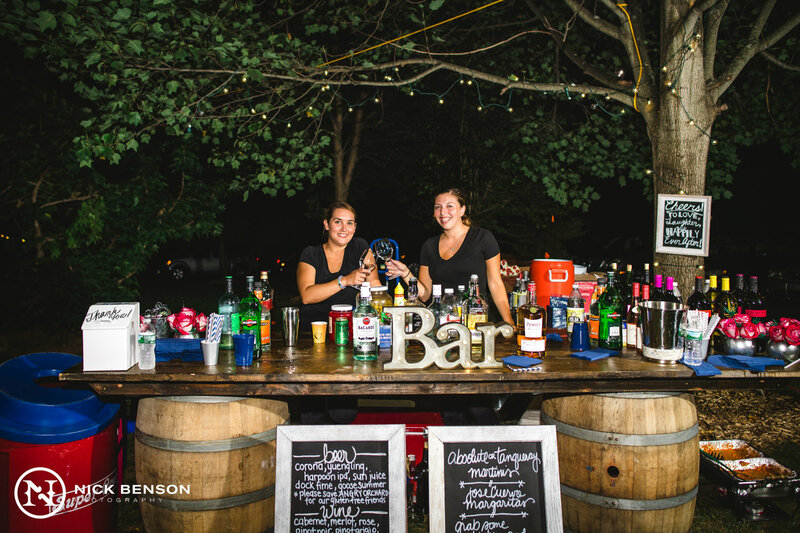 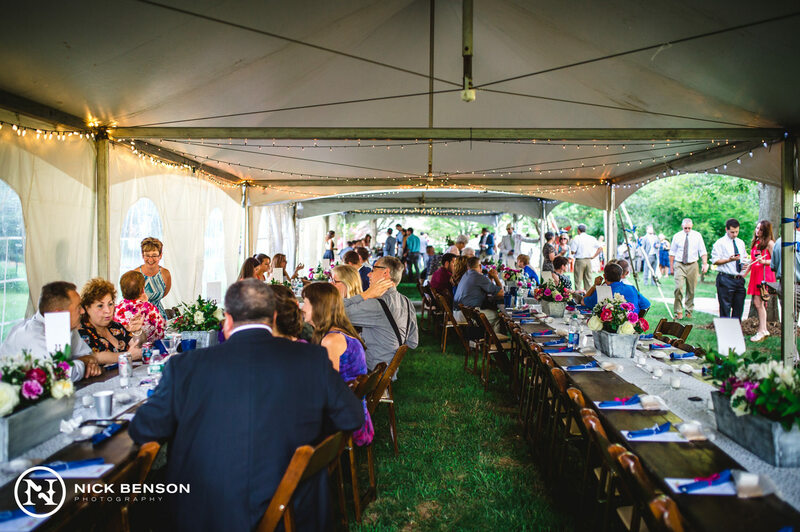 A gourmet, wood-fired pizza dinner was provided by New Haven Pizza Truck, and the bar was set-up on two wine barrels; which really completed the elegant yet rustic, outdoor theme that they worked so hard to create. 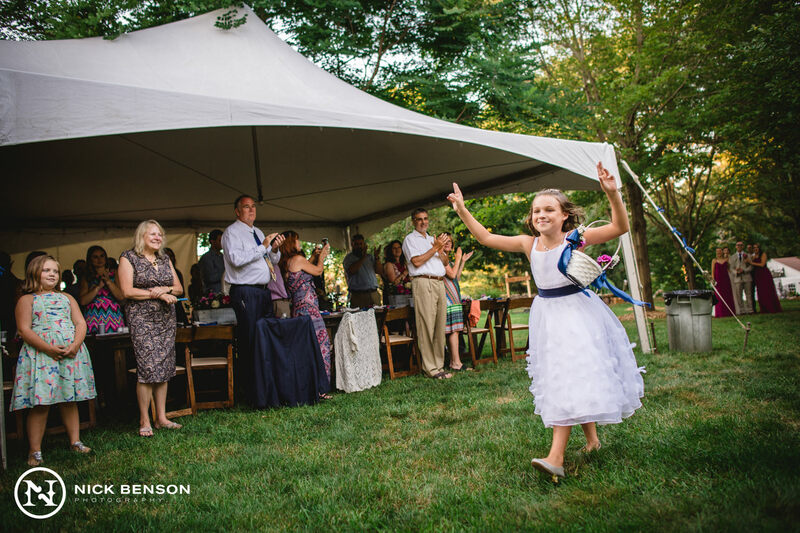 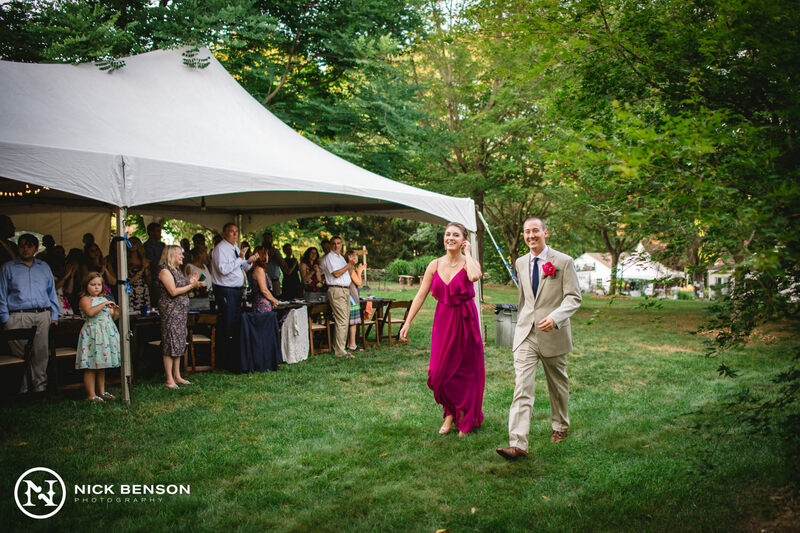 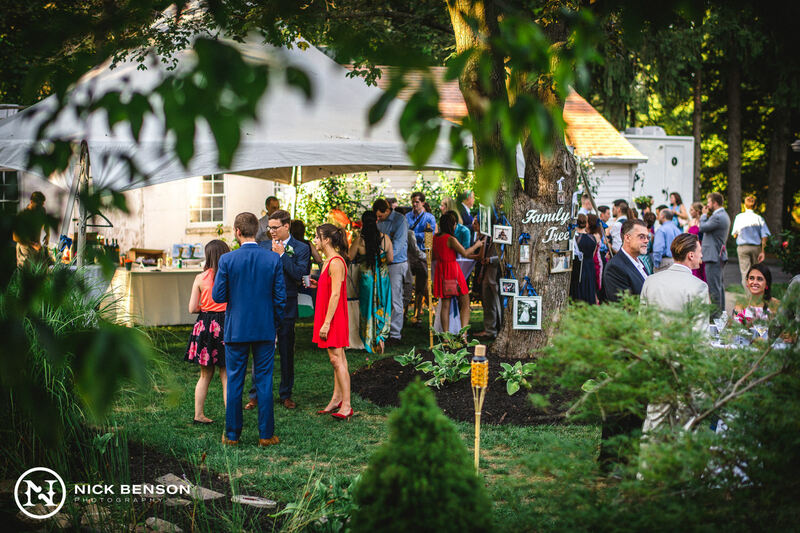 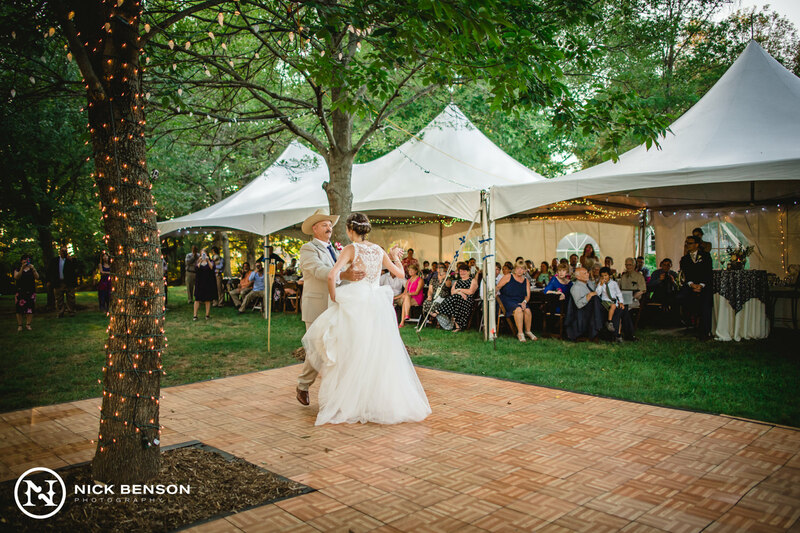 Although they may have taken a risk by not putting a tent over the dance floor, the way that they used their favorite tree as the focal point and laid out the dance floor around its trunk, really opened up the entire space. 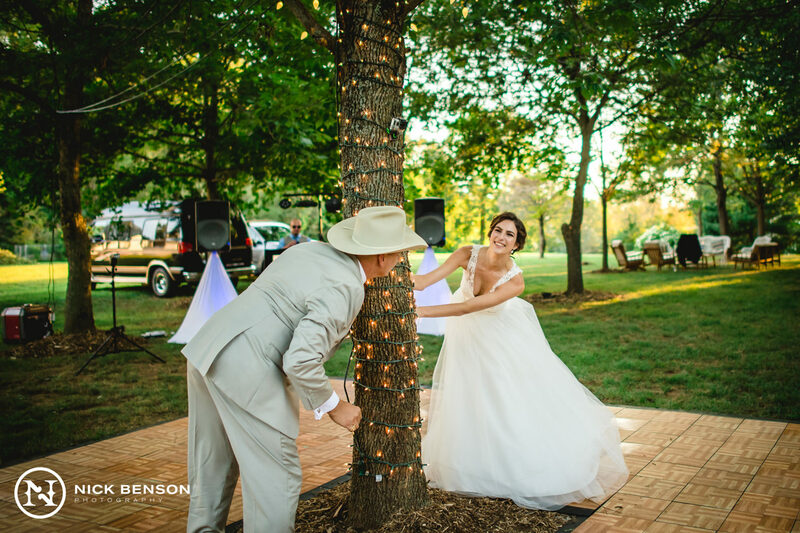 Decorative string lights wrapped around the tree trunks and spread throughout the branches, illuminating the celebration into the night. 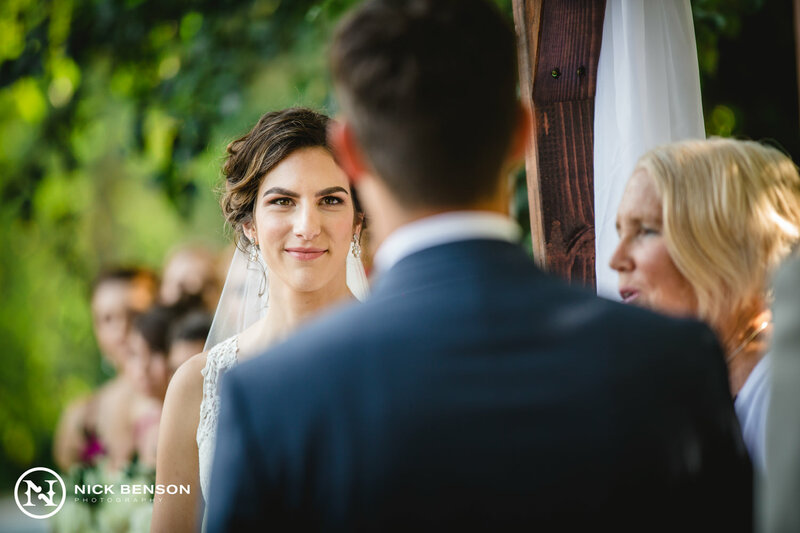 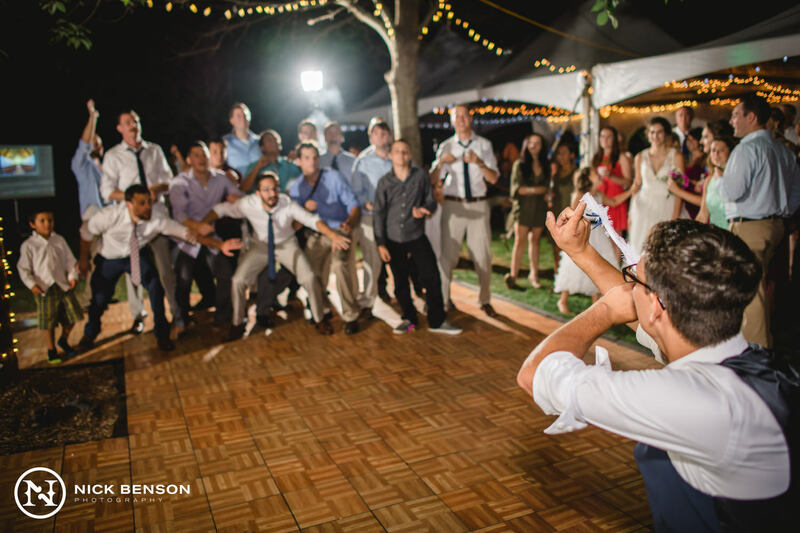 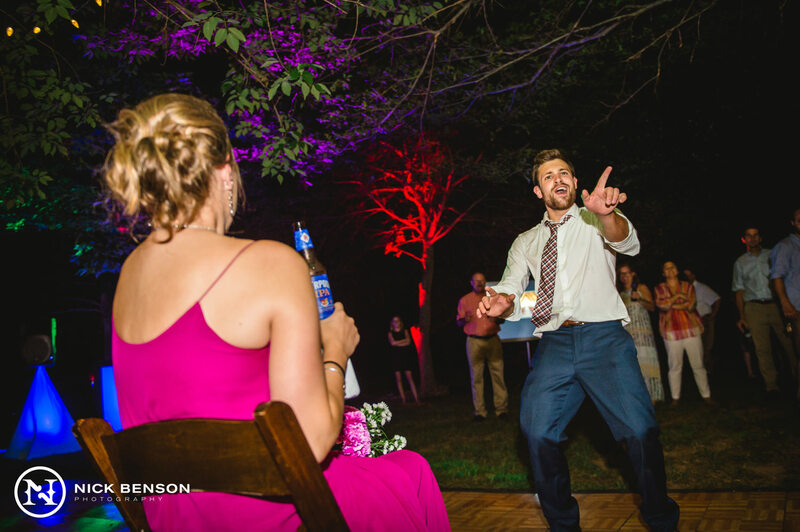 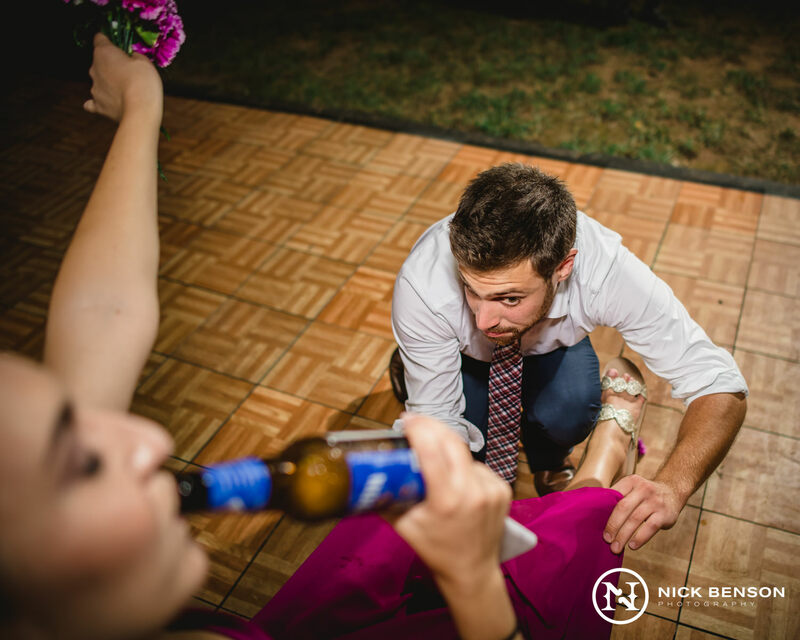 The whole night felt magical far different from what you might expect upon hearing the term, “backyard wedding”. 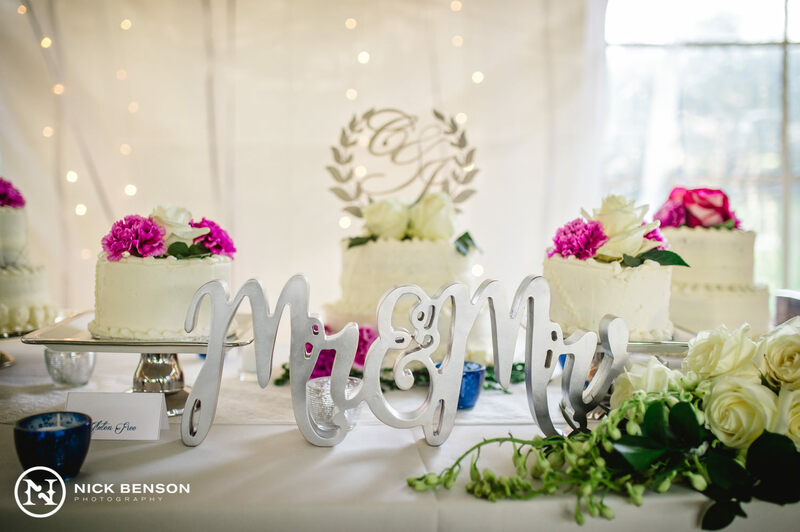 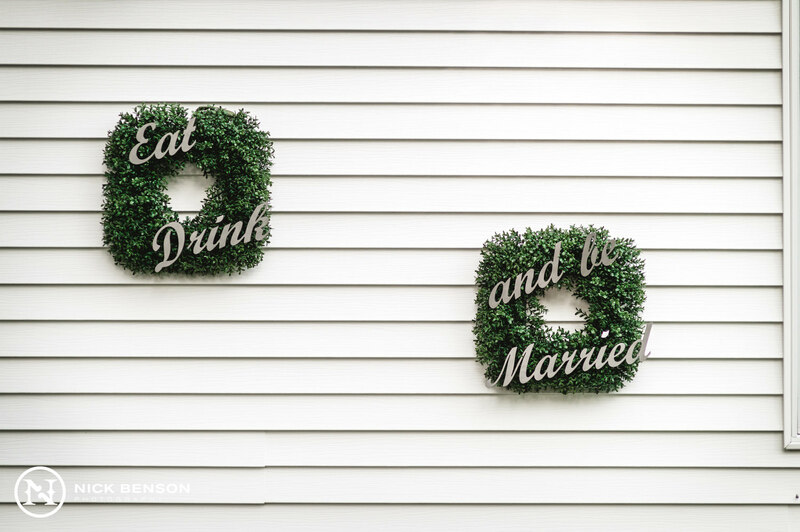 With a little creativity and convenient access to the necessary machinery, Joe custom-designed and cut several stainless steel signs which were displayed throughout the reception; with our favorite being their cake topper. 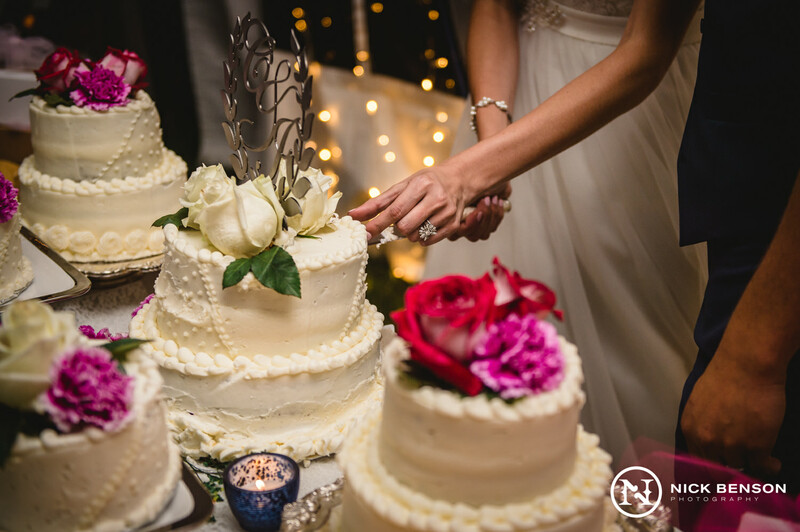 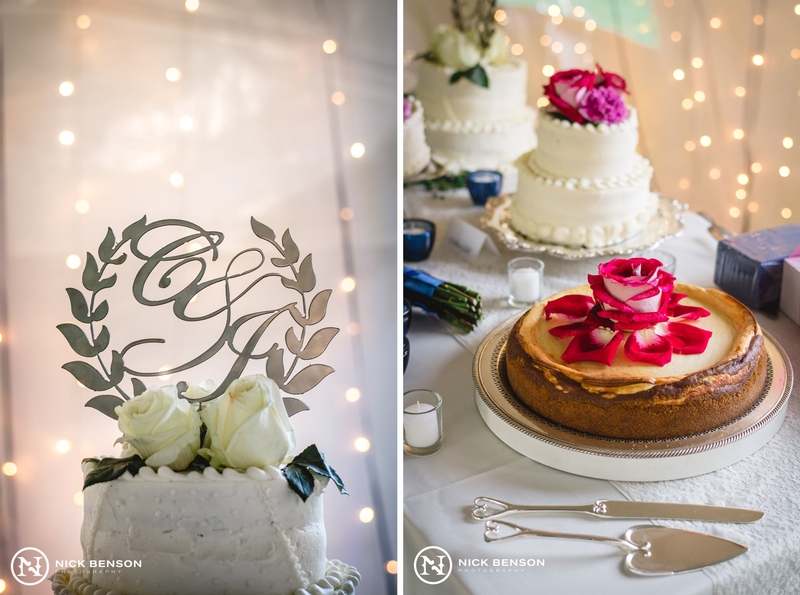 The monogrammed design on the top of the cake really stood out to us and will make for a great personal touch, custom-imprinted on the cover of their wedding album. 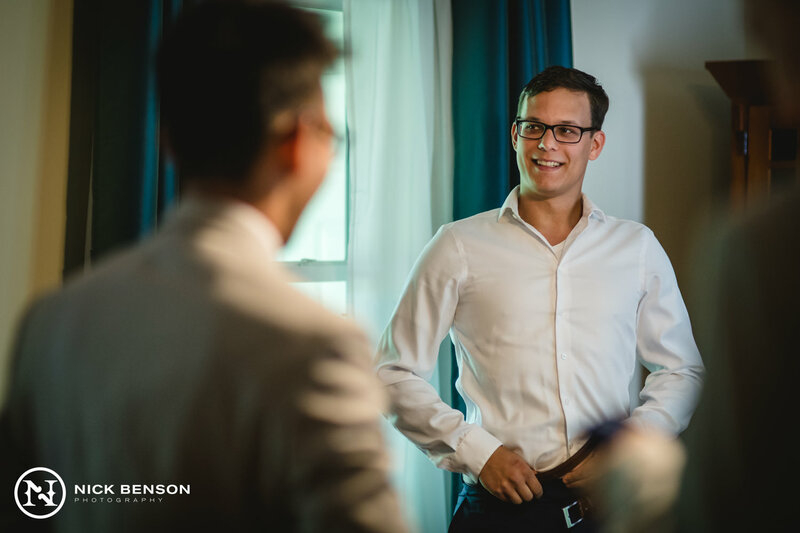 Joe even took the time to make us a stainless steel emblem of our logo, which was a nice surprise! 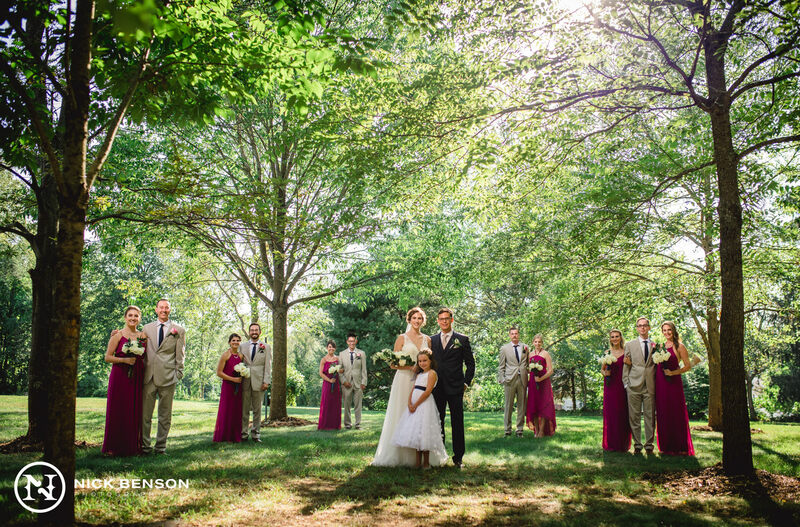 All of these details came together to create a picture-perfect setting, better than anyone could have imagined. 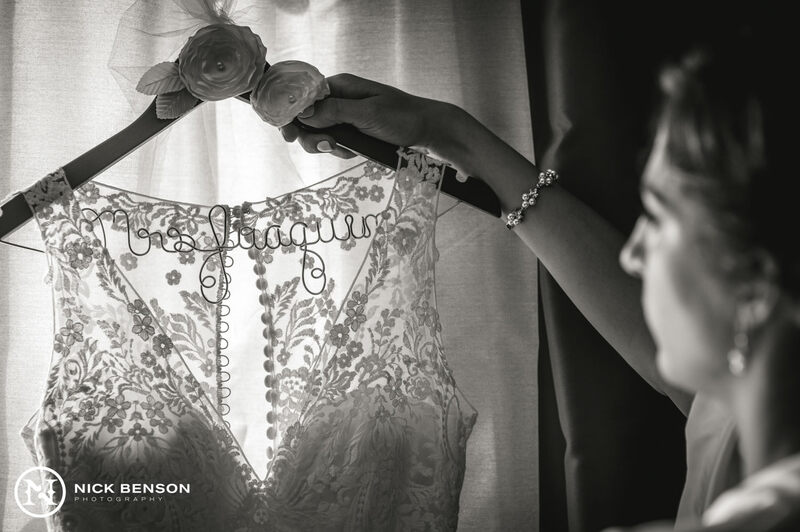 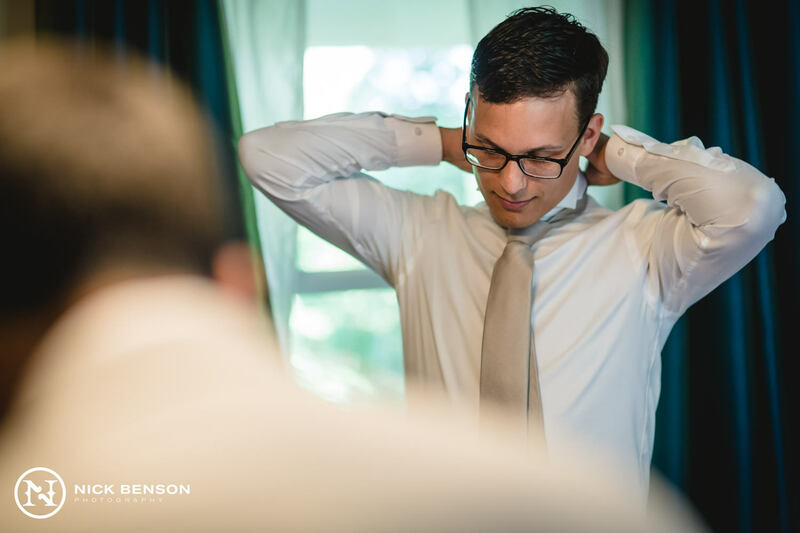 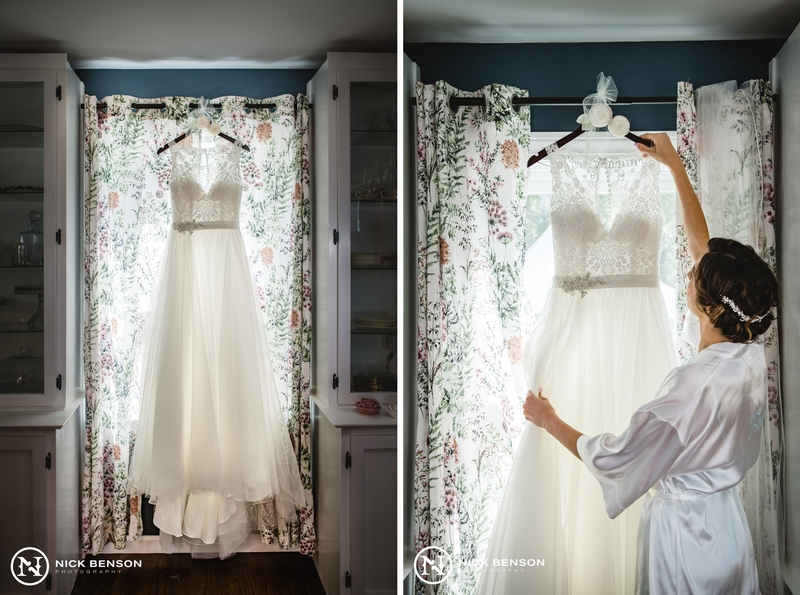 Because these memories are forever tied with their home and all the time and effort they put into every little detail of the day, it’s really exciting to think that their wedding photographs take on a whole new meaning for them. 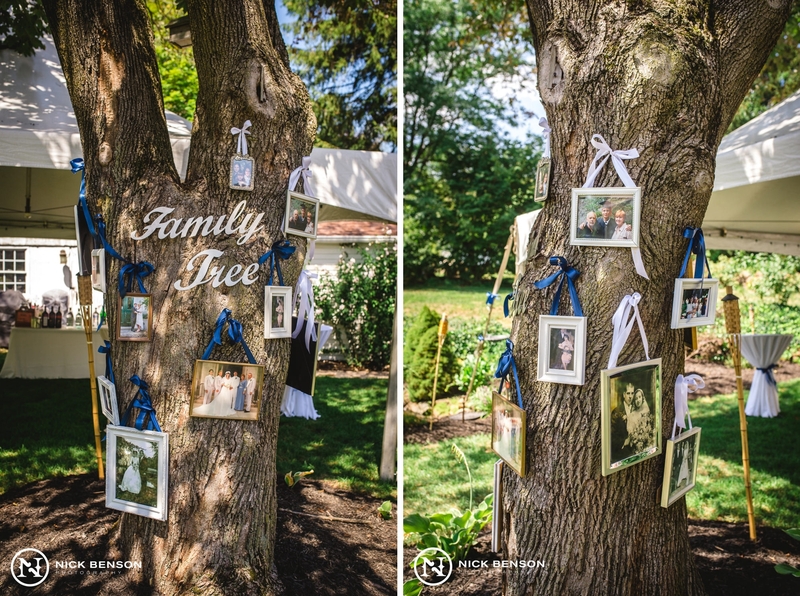 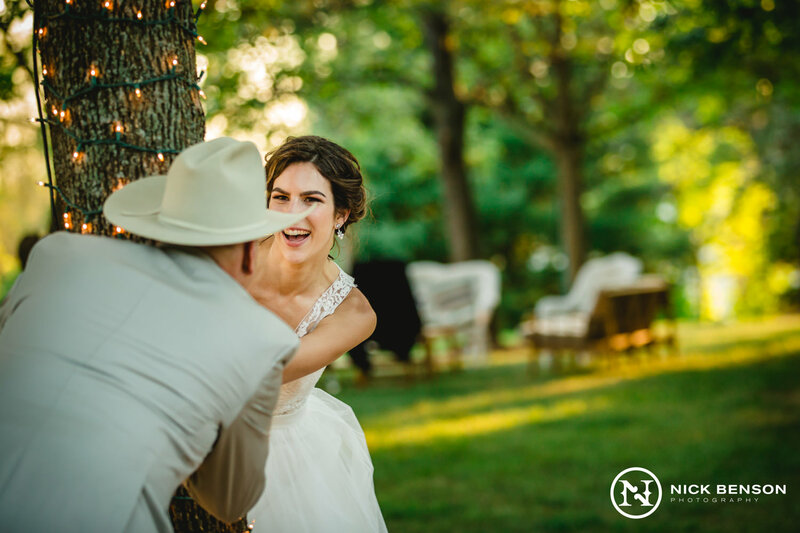 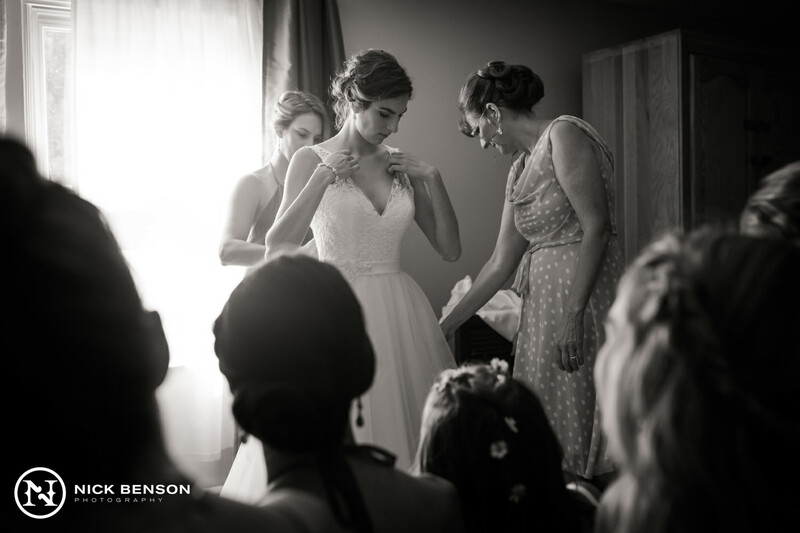 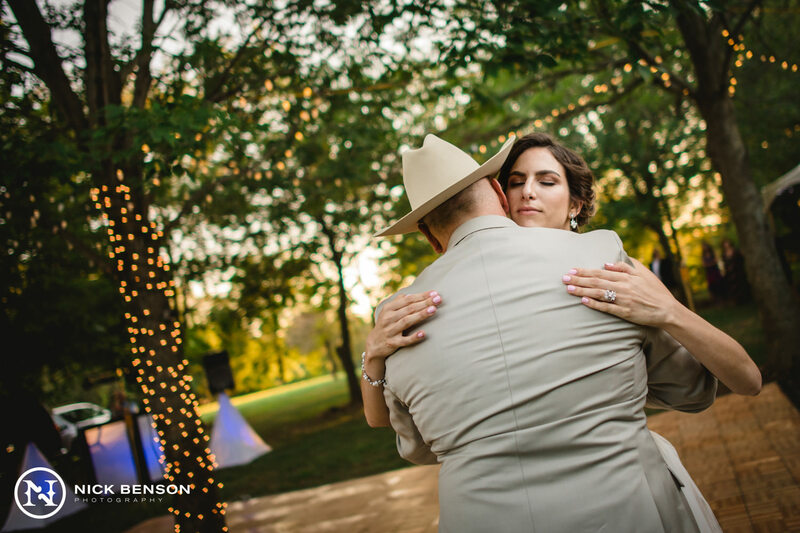 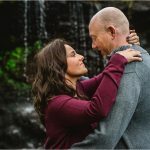 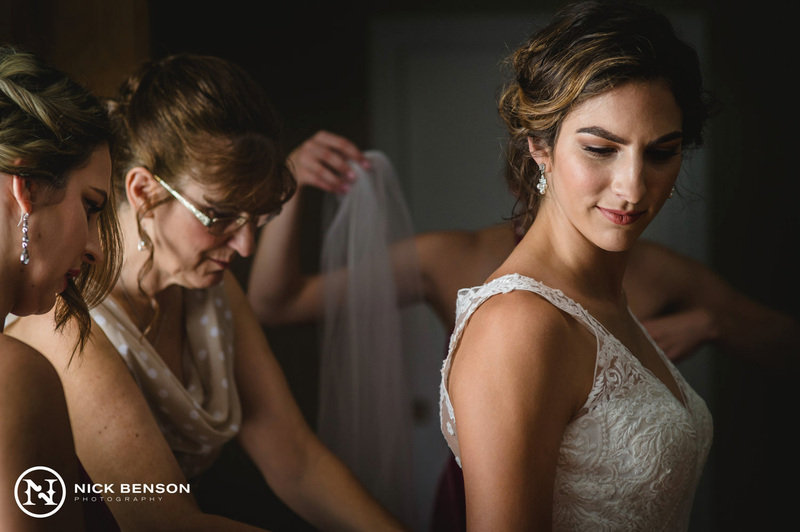 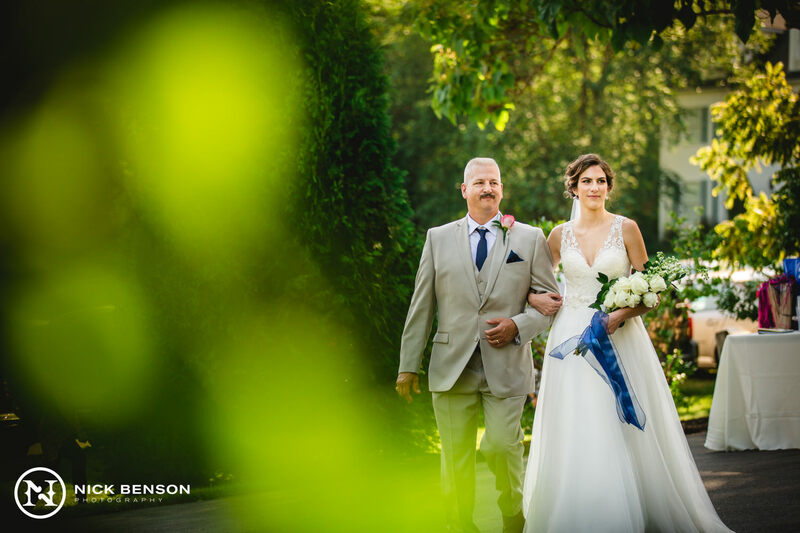 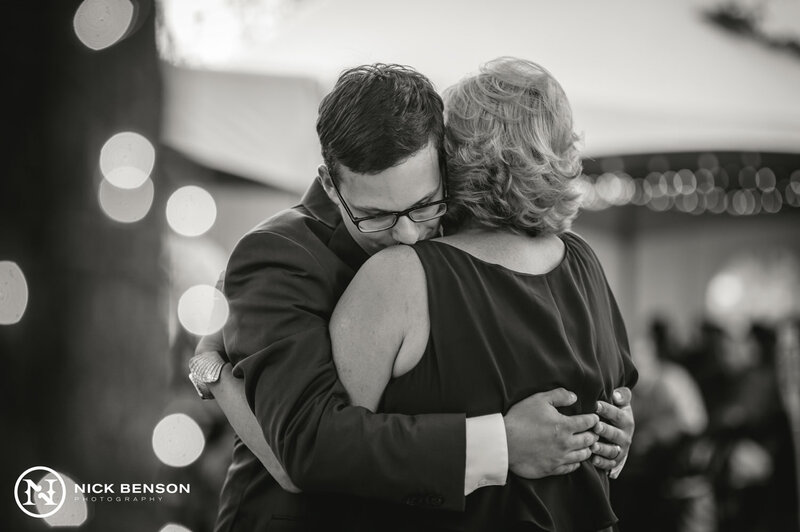 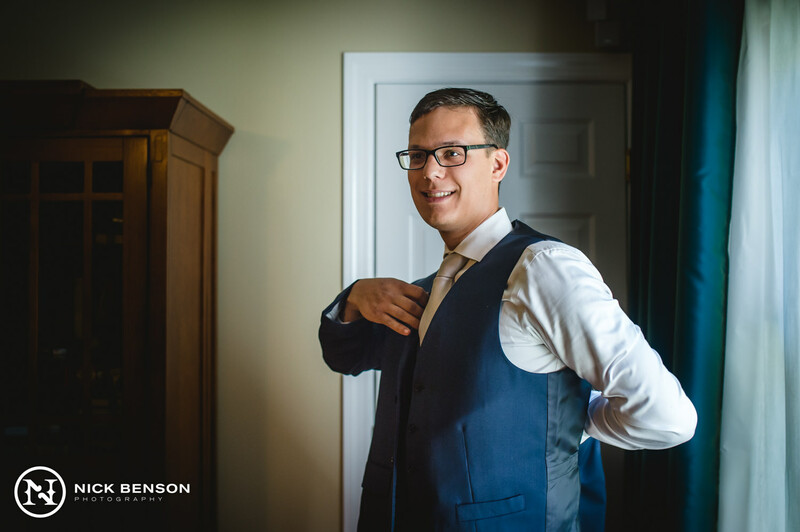 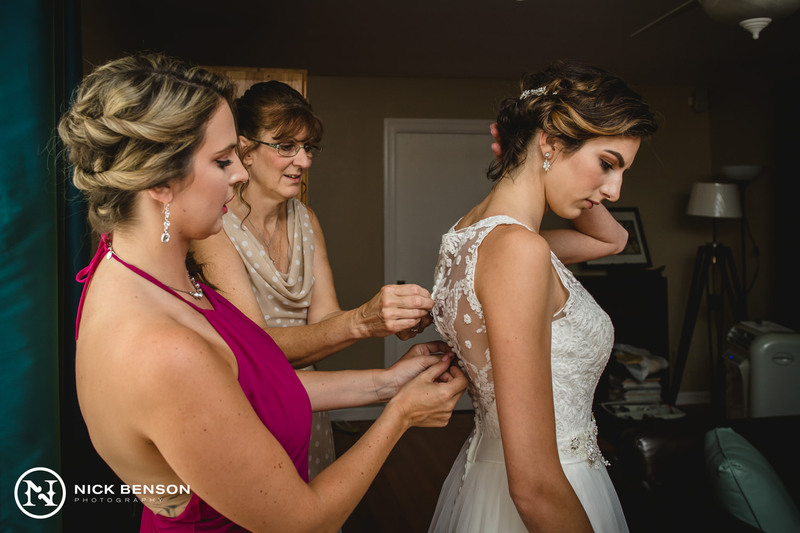 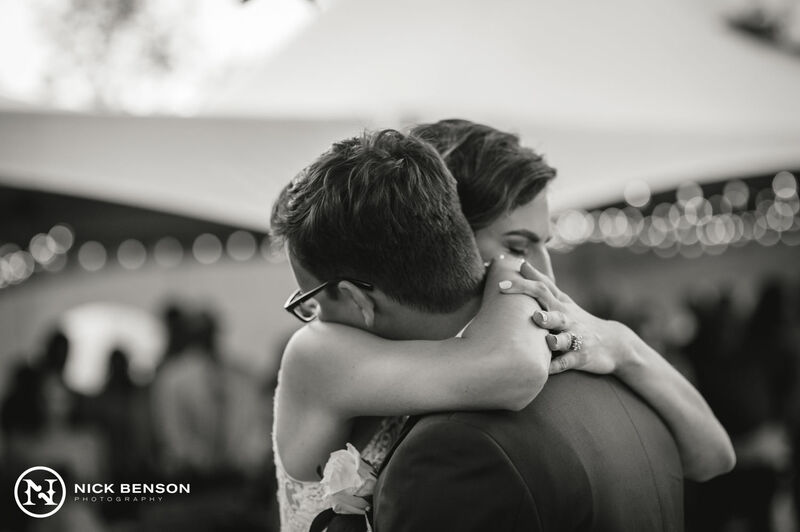 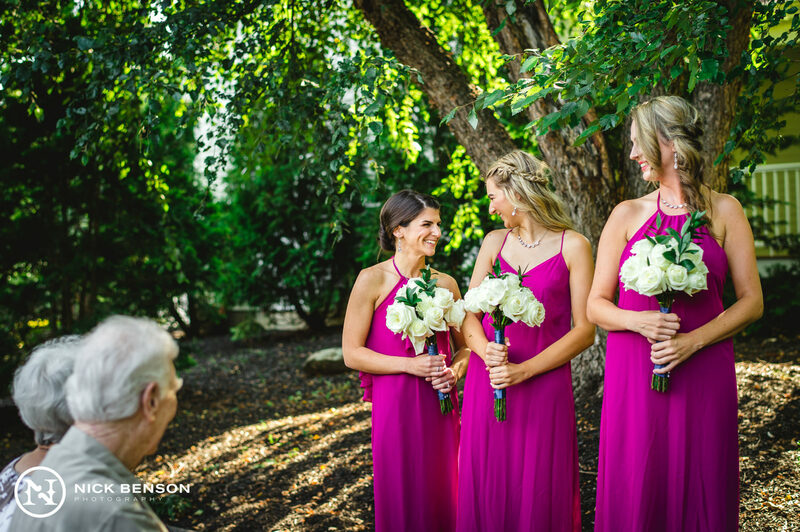 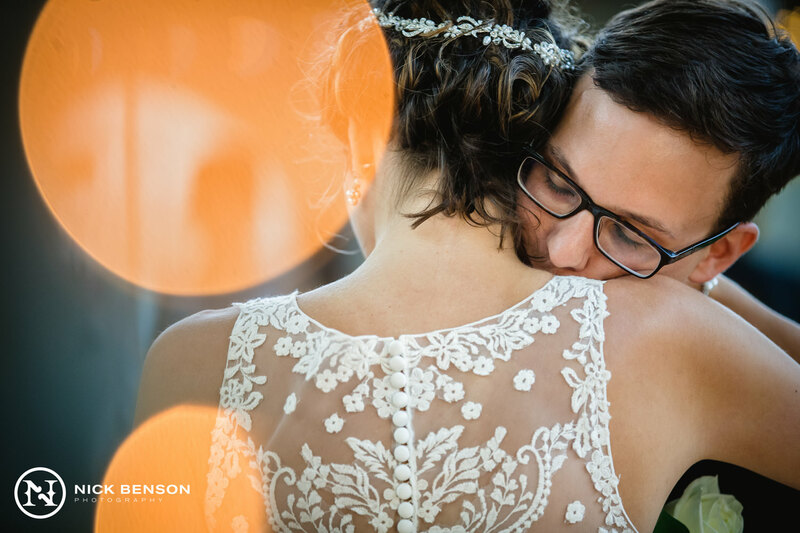 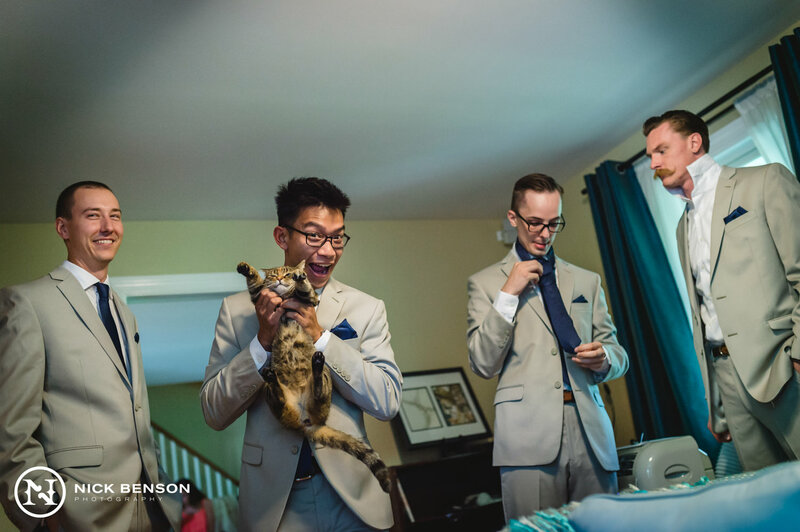 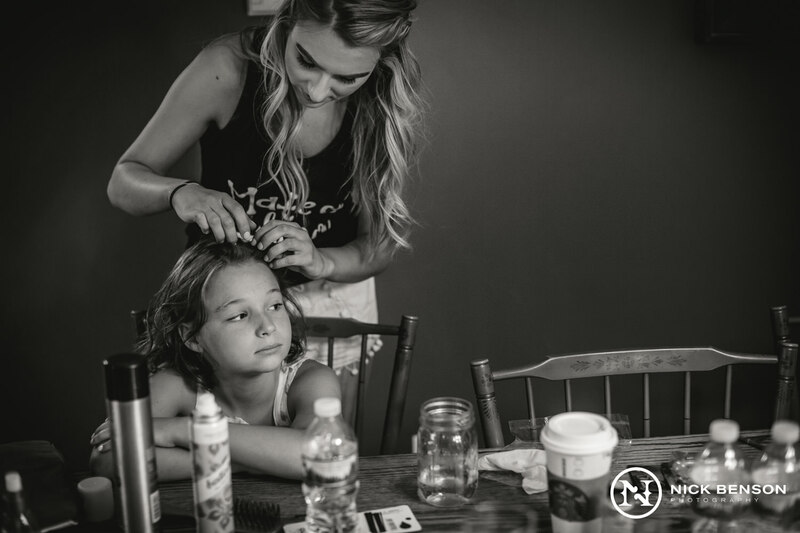 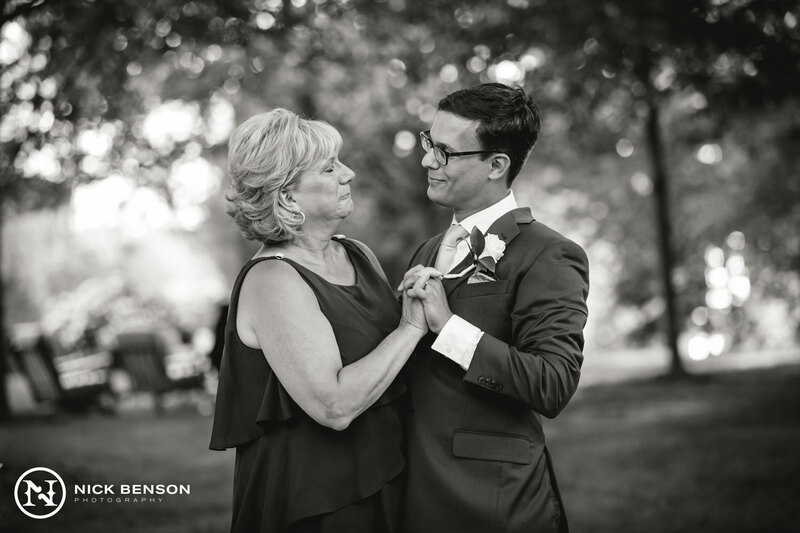 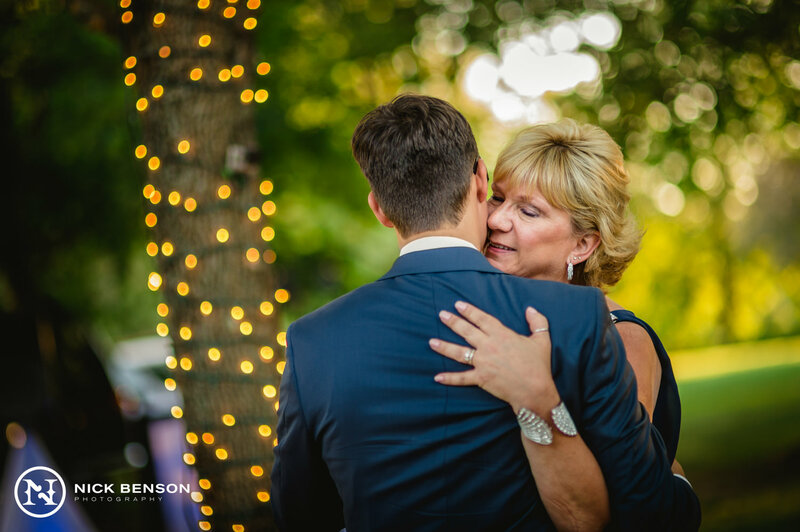 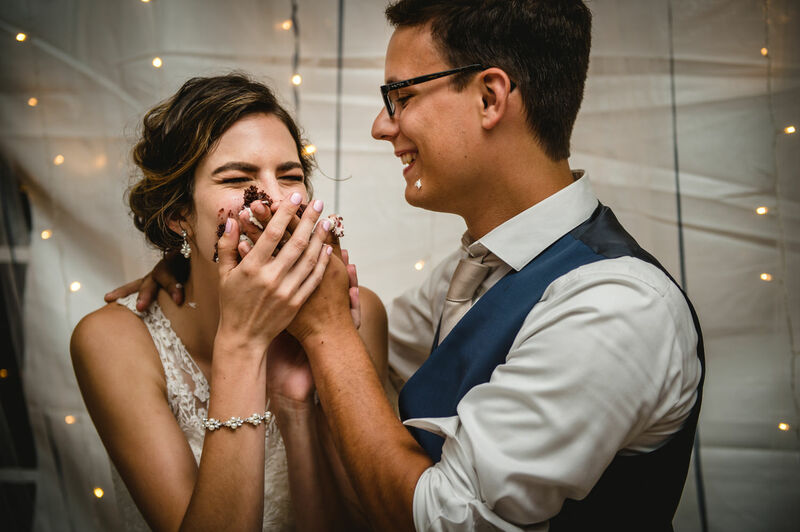 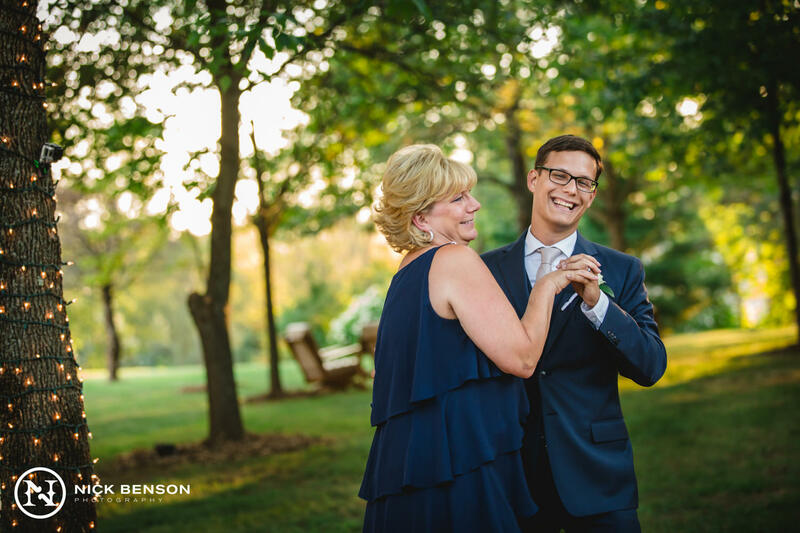 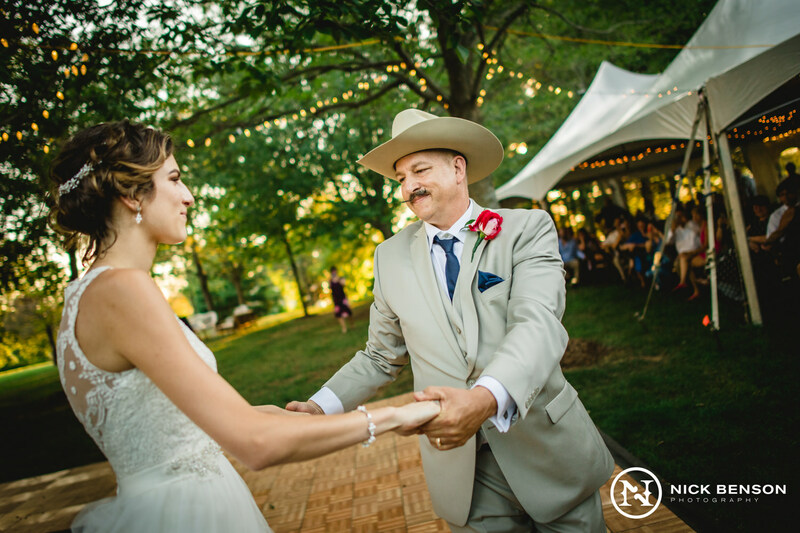 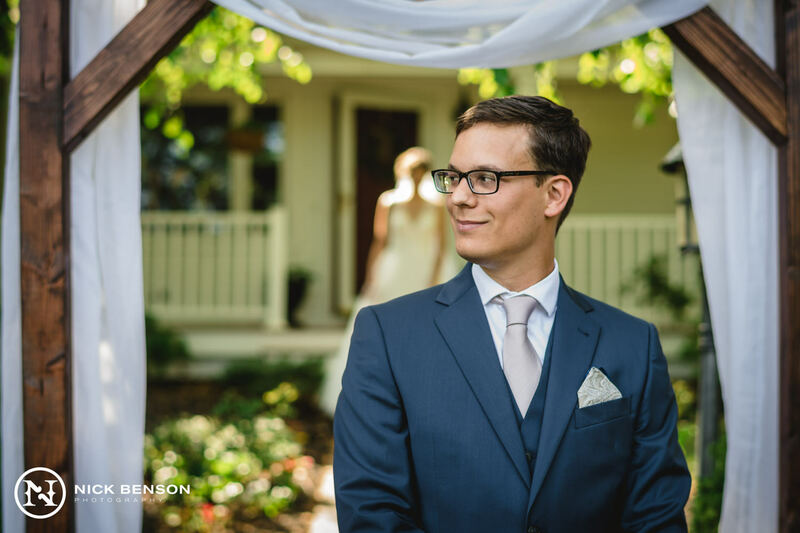 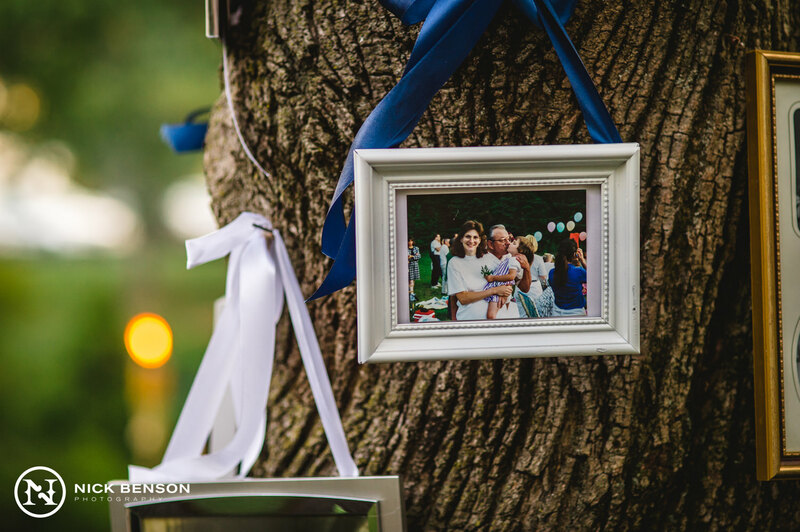 Their photos have a deeper layer of connection to their lives as well as their families (especially everyone who helped out to make their dream a reality), which is one thing that a traditional wedding venue could never provide for them. 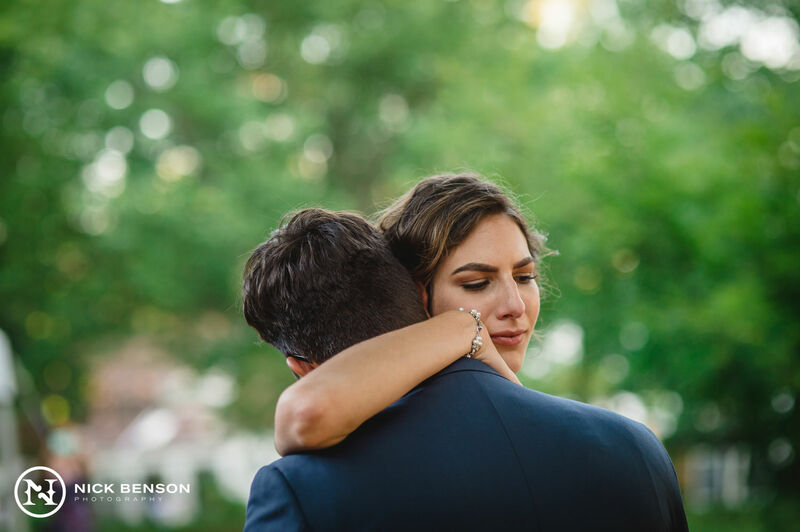 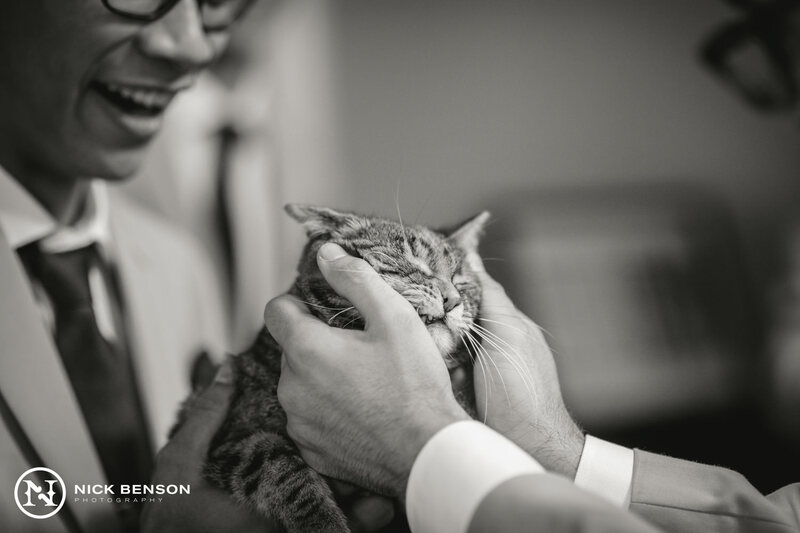 Their personalities, their love for each other, and their friendship truly shined throughout the memories we were honored to capture for them. 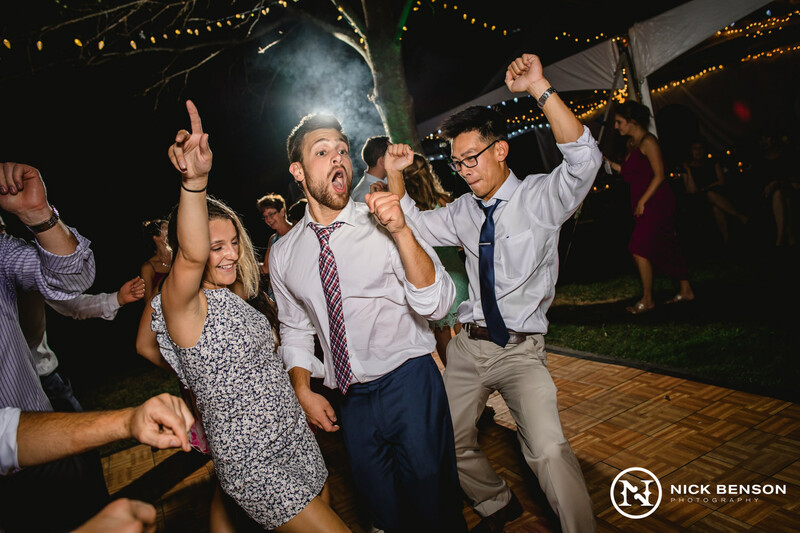 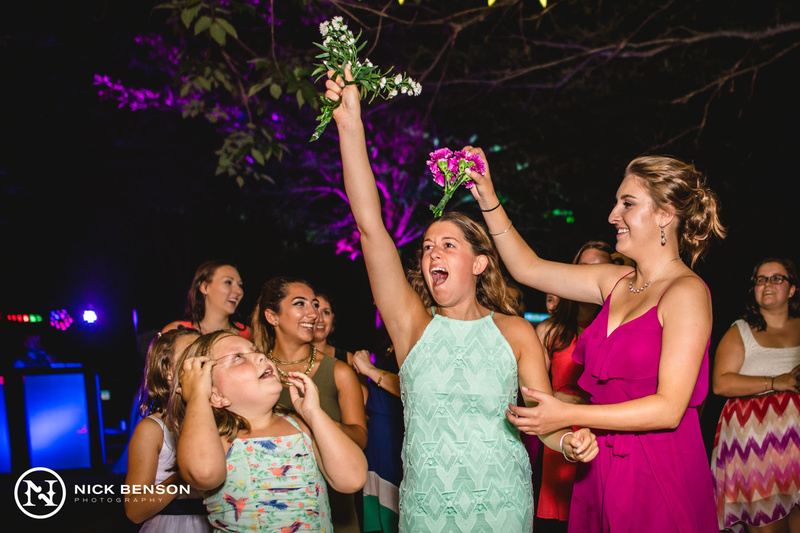 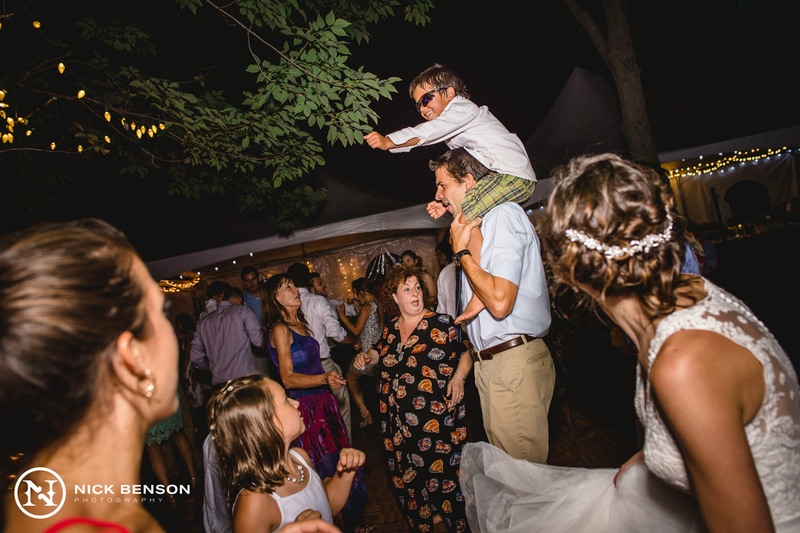 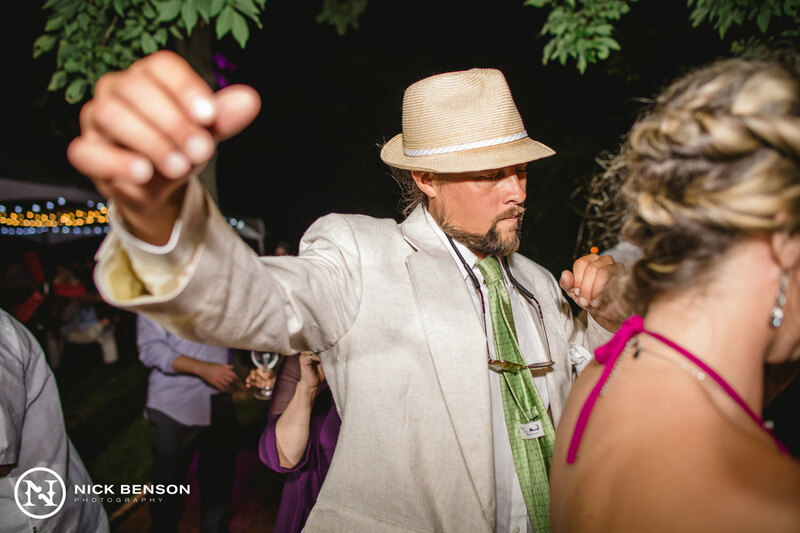 Everyone let loose and had so much fun on the dance floor (including us!). 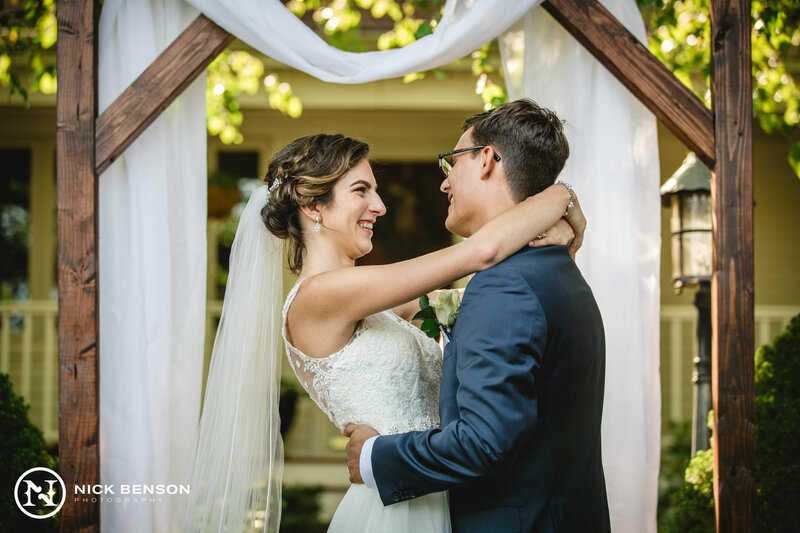 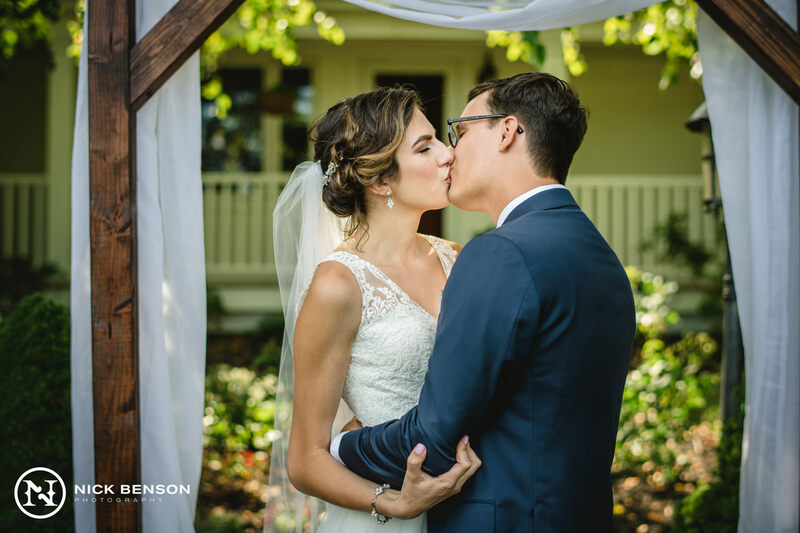 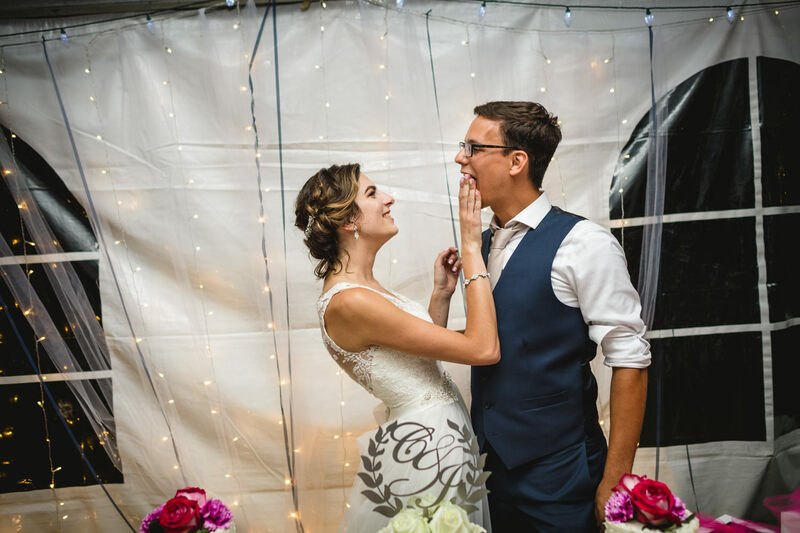 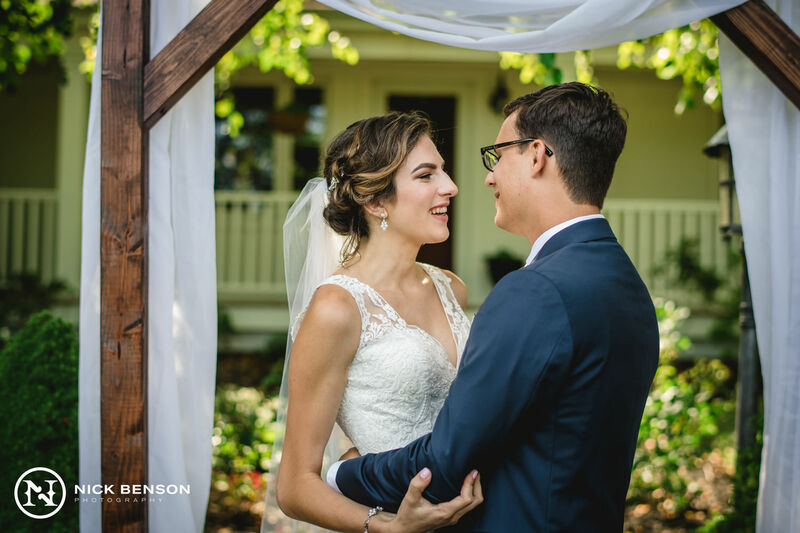 This backyard wedding is one for the books and will stand out in our minds for years to come, as it was unlike anything we have ever shot before. 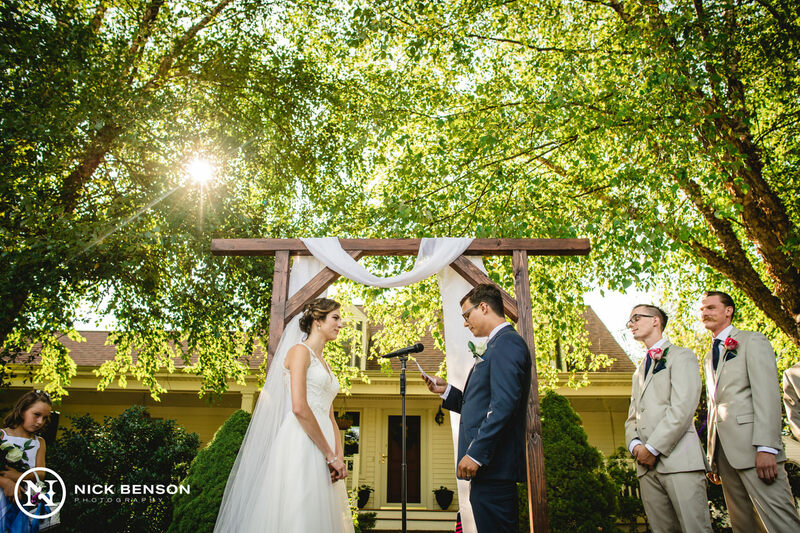 We’re bummed that we’ll never have the opportunity of shooting at this venue again!